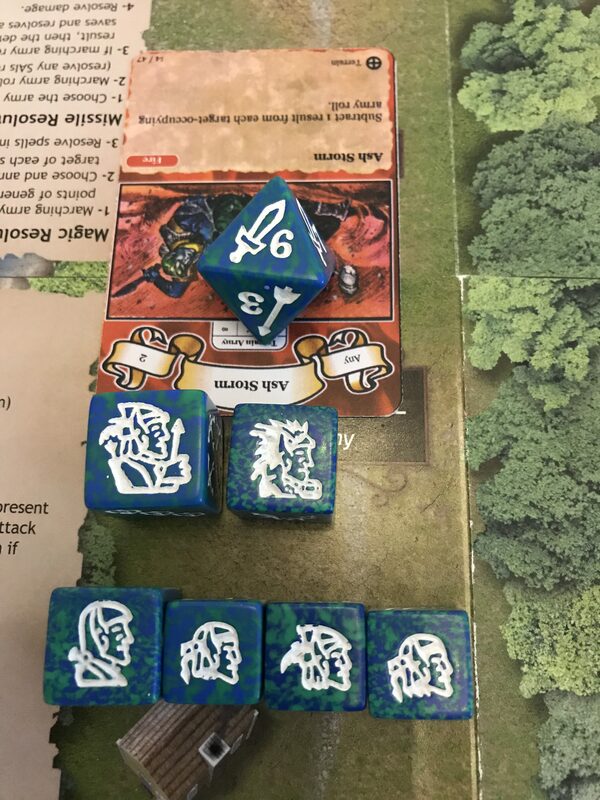 As the use of 4 health monsters has, once again, been avoided in this second demonstration game, there remain only 6 SAIs that appear on the Coral Elf and Dwarf dice in use. 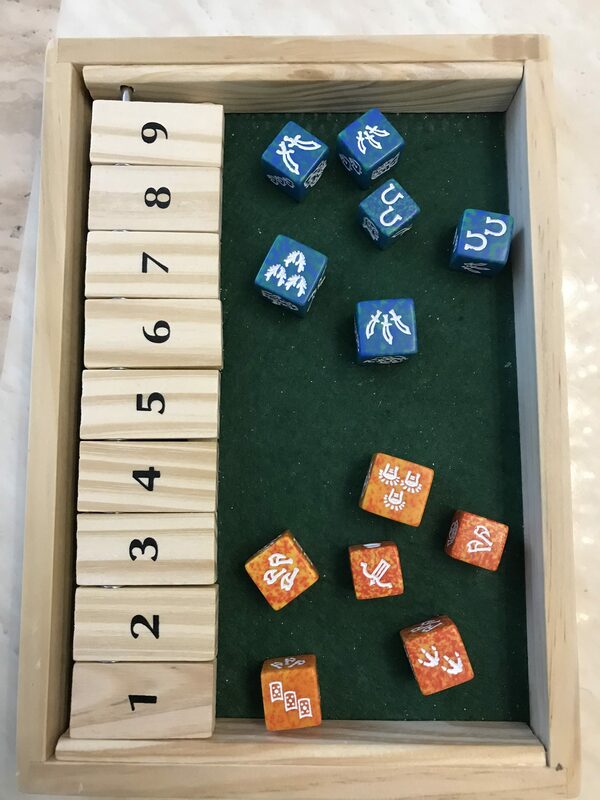 These all appear on the 3 health (otherwise known as ‘rare’ dice merely as a way of distinguishing them from 1 health ‘common’ dice and 2 health ‘uncommon’ dice – it is not a reflection on either their difficulty to obtain, nor on their monetary value) and are shown below along with their effects. Click on images to enlarge. 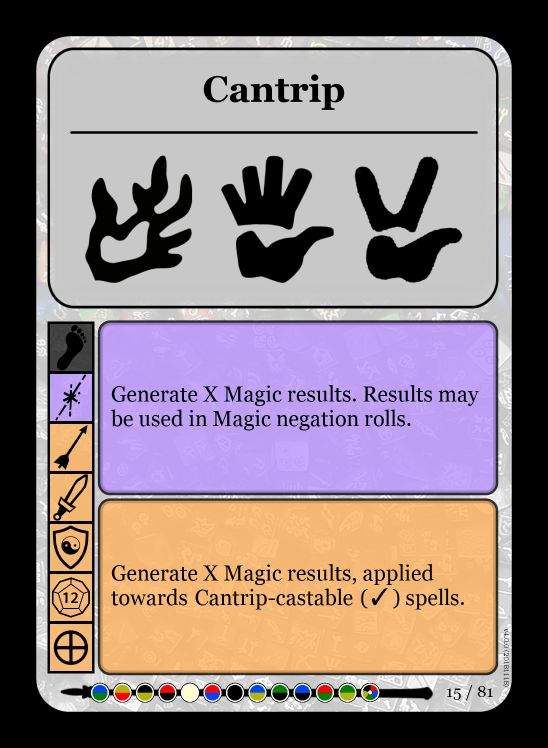 Unlike in the previous introductory game, where I deliberately kept the use of magic down to the minimum, here I have tried to illustrate as many spells as possible that are available to the two armies. 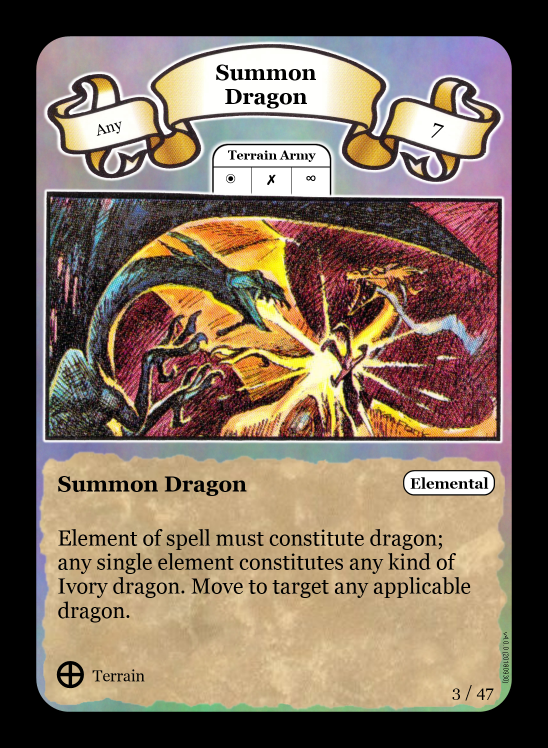 Below is a list of the spells used. 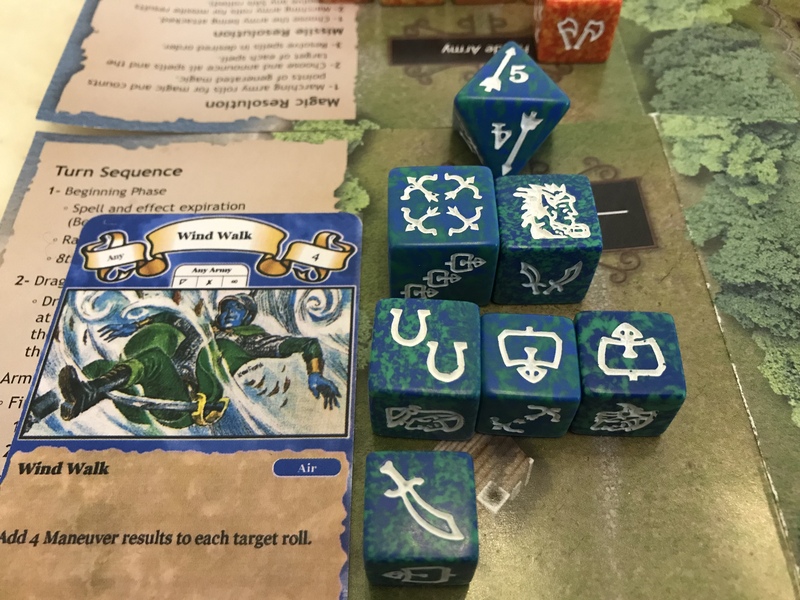 We have already seen the racial abilities Coastal Dodge and Mountain Mastery in the previous post (Introductory Game: Dwarves verses Coral Elves), which were tied to the elements of water (green) for the elves and earth (yellow) for the dwarves respectively. 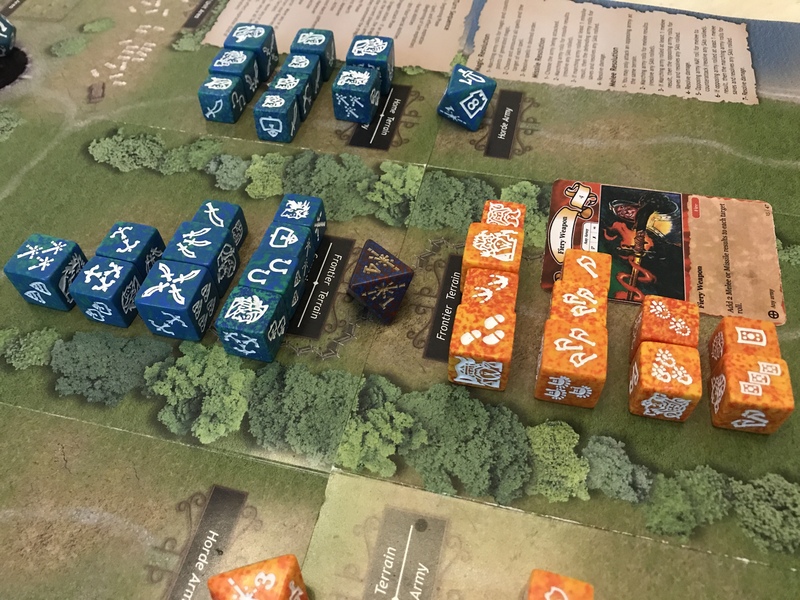 In this game I will introduce and use the abilities connected with the other elements of the two races – air (blue) for the Coral Elves (called Defensive Volley) and fire (red) for the Dwarves (called Dwarven Might). 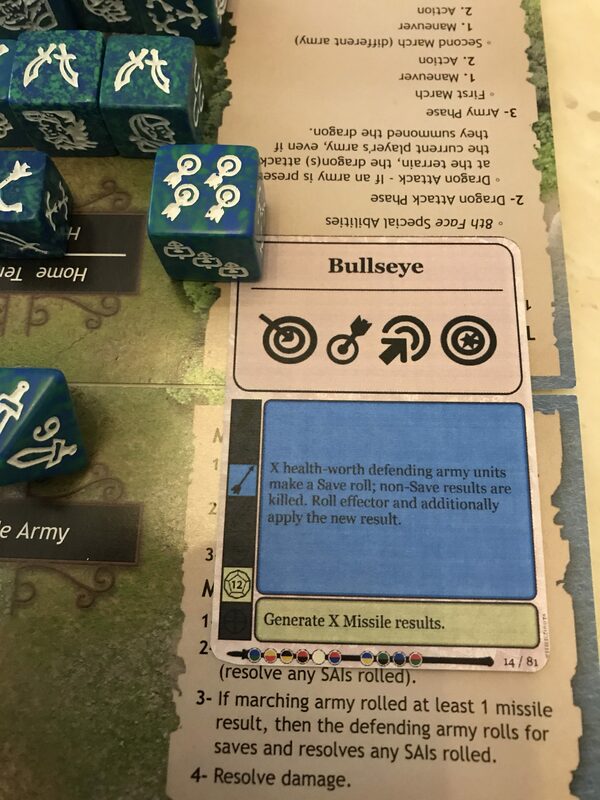 When Coral Elves are at a terrain that contains the element air (Blue), such as the Coastland or the Wasteland that I have deliberately placed in the army selections below, when attacked by missile fire, they are able to counter attack with missile fire of their own, irrespective of the action currently showing on the terrain where they are currently posted. 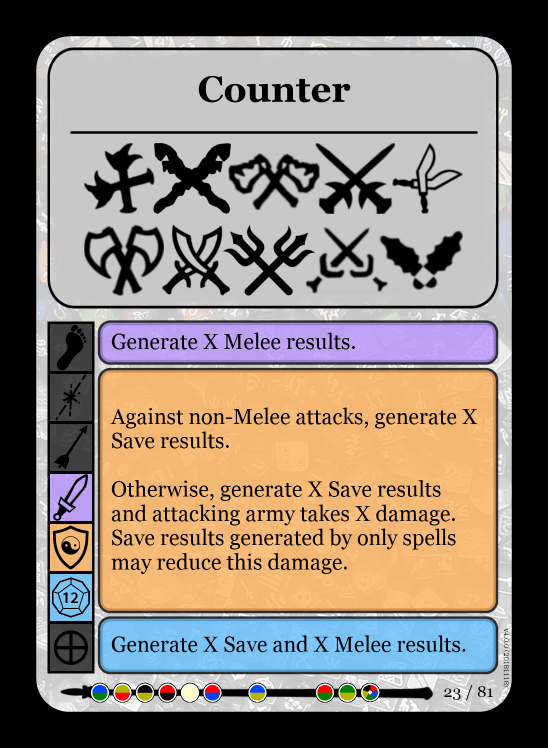 When Dwarves are at a terrain that contains the element fire (Red), such as the Highland or the Wasteland that are selected in the armies below, when carrying out a melee counter attack, their save results count as melee as well as the usual results from melee icons. 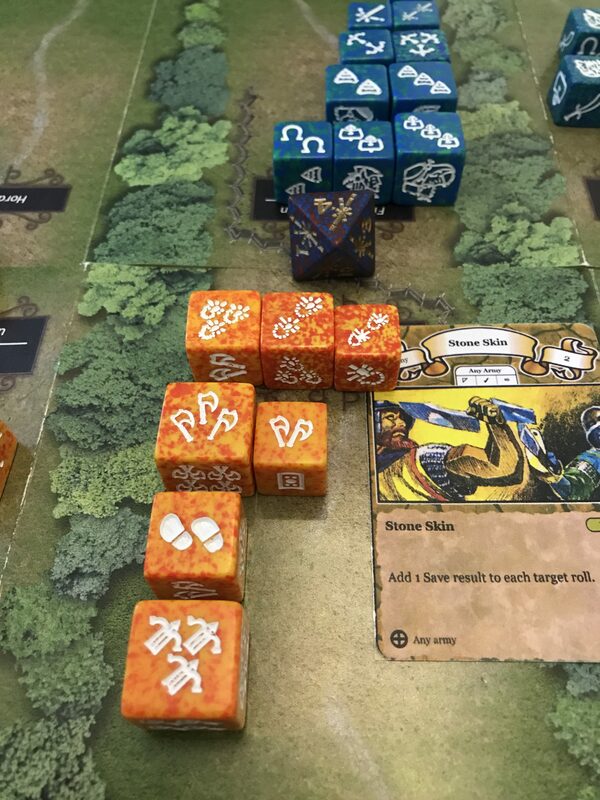 The Coral Elves make a defensive start to the battle as they are more than aware that they are extremely vulnerable to the Dwarf army in their home territory at the temple in the highlands. 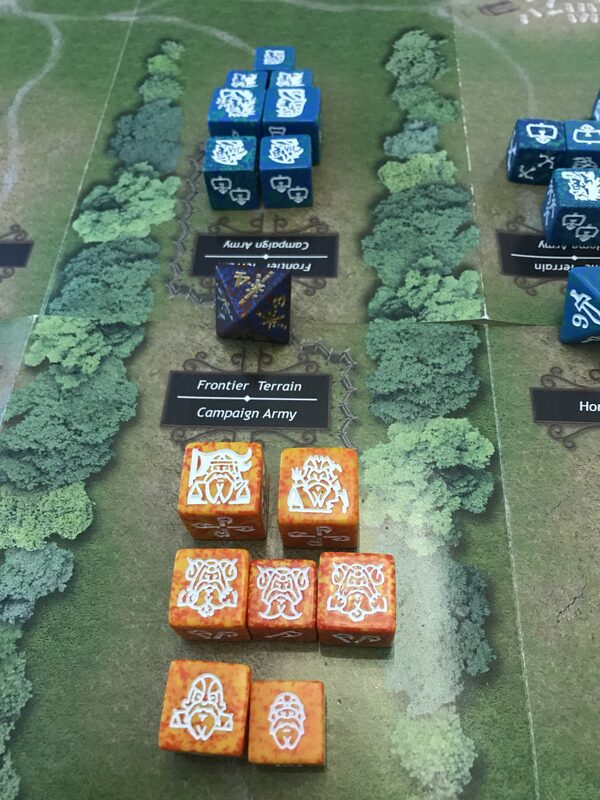 The elvish cavalry produce 8 manoeuvre results. 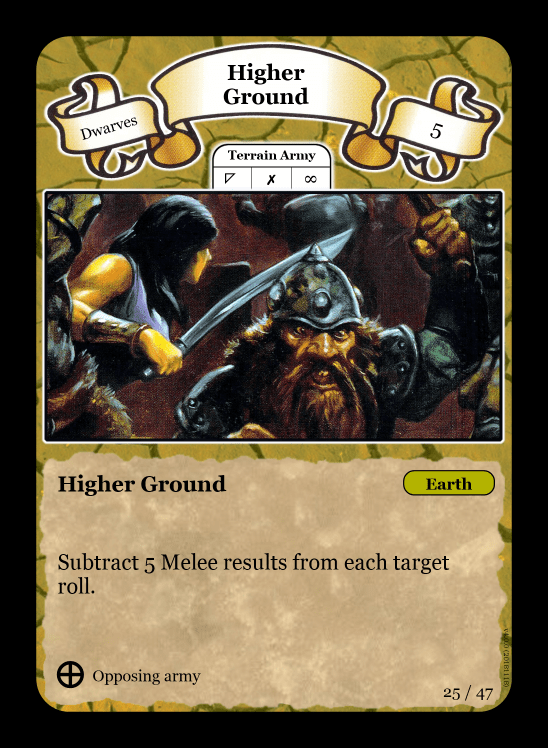 The Dwarves’ Mountain Mastery, where they use melee results to count as manoeuvres in the highlands, still does not generate enough results (only 7) to stop the elves taking the early advantage. 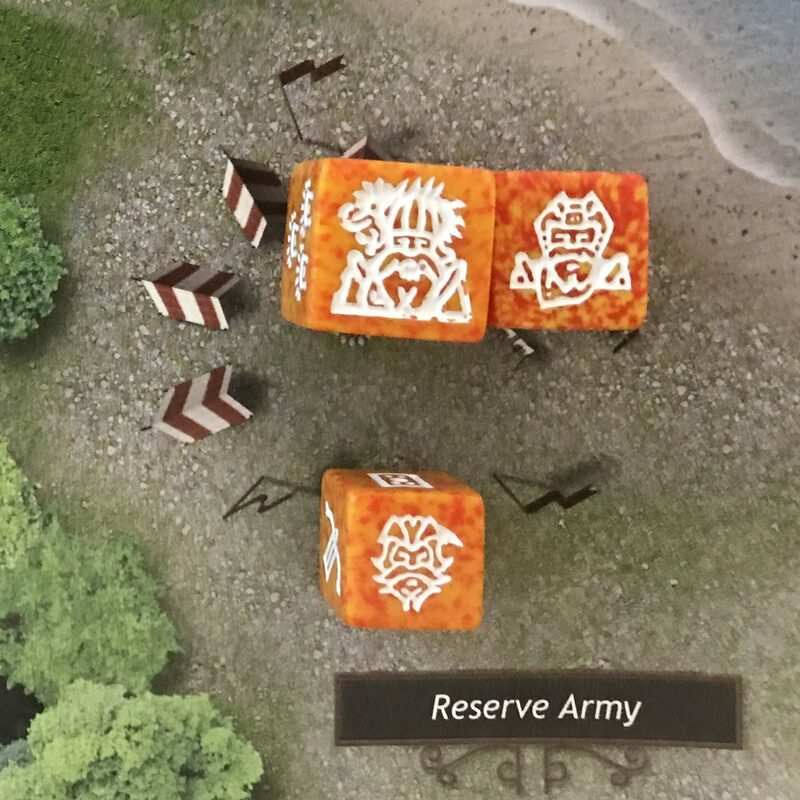 Seeing that the dwarves are infantry rich, the elves force them away from the temple and the terrain turns down to its second face. 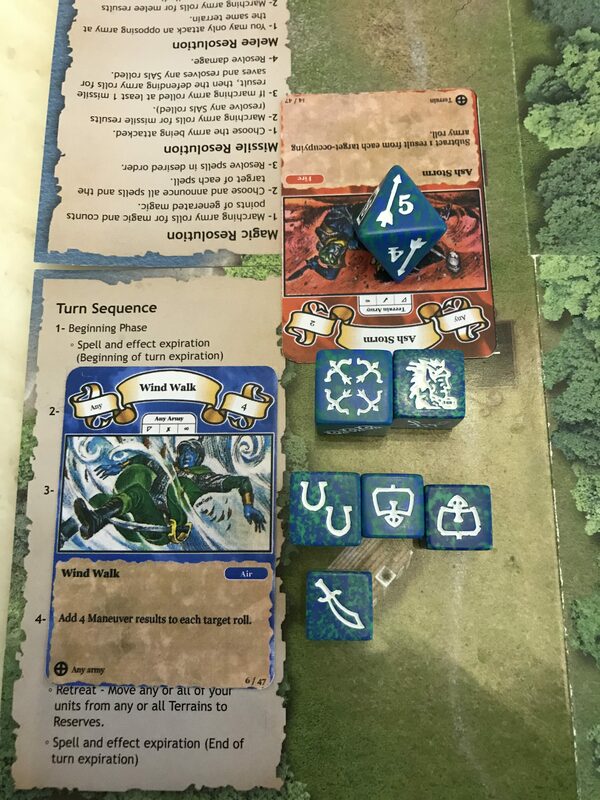 While the terrain is showing the magic icon, the elves try their hand and produce 5 points of blue and/or green magic. 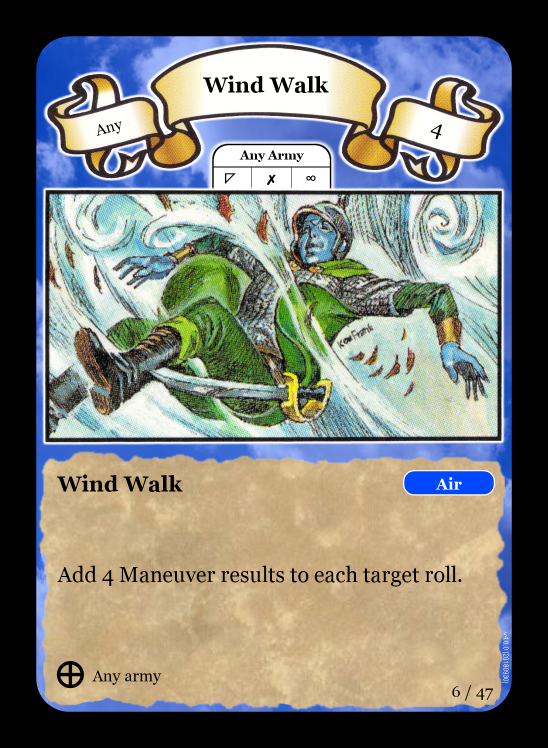 …and seeing the size of the Dwarven horde, they use a Wind Walk air magic spell to assist their home army to keep their distance. 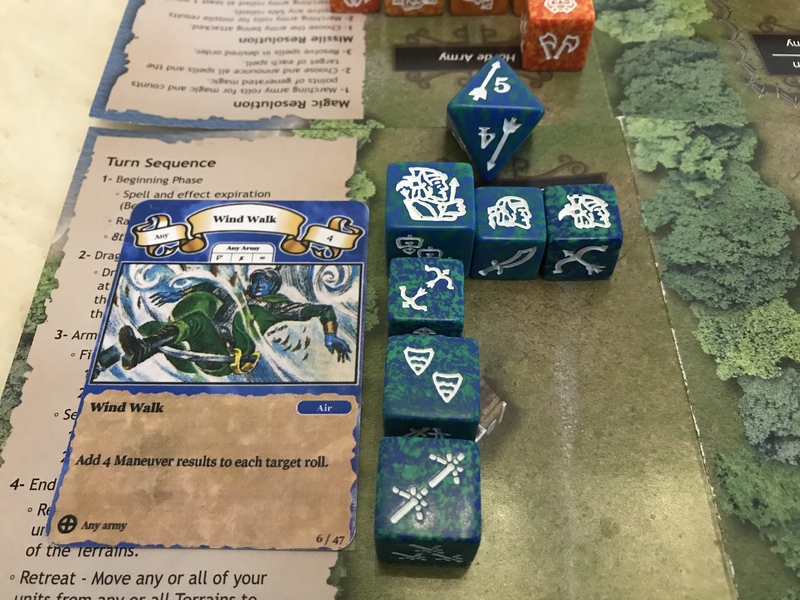 With no use of Mountain Mastery in the coastland terrain, the dwarves are no match for the nimble elves, buoyed further by the Wind Walk spell from their kin over in the highlands, and manage a mere 2 manoeuvres against the 9 produced by the elves (5 from ID rolls and 4 from the spell). 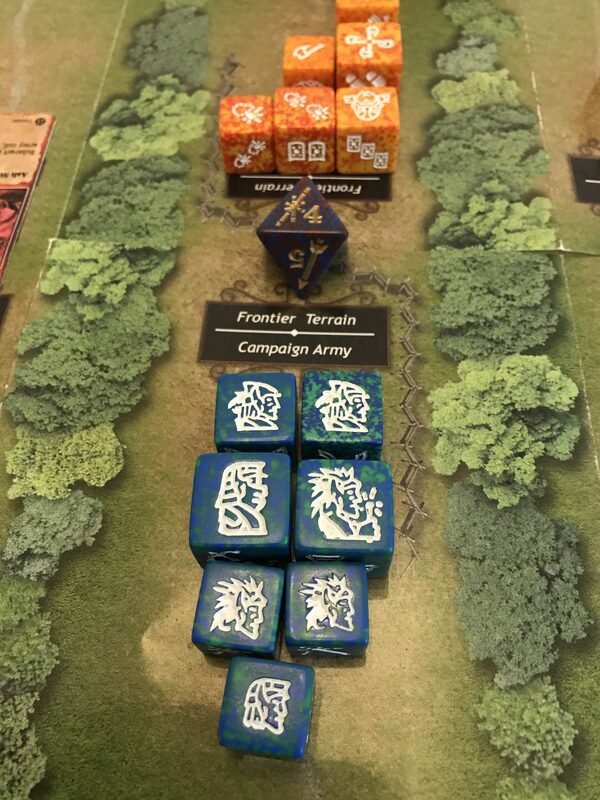 The elves retreat from melee distance, knowing that they are outmatched by the dwarf infantry in melee, and the coastland tower moves down to its 5th face, back into missile distance. 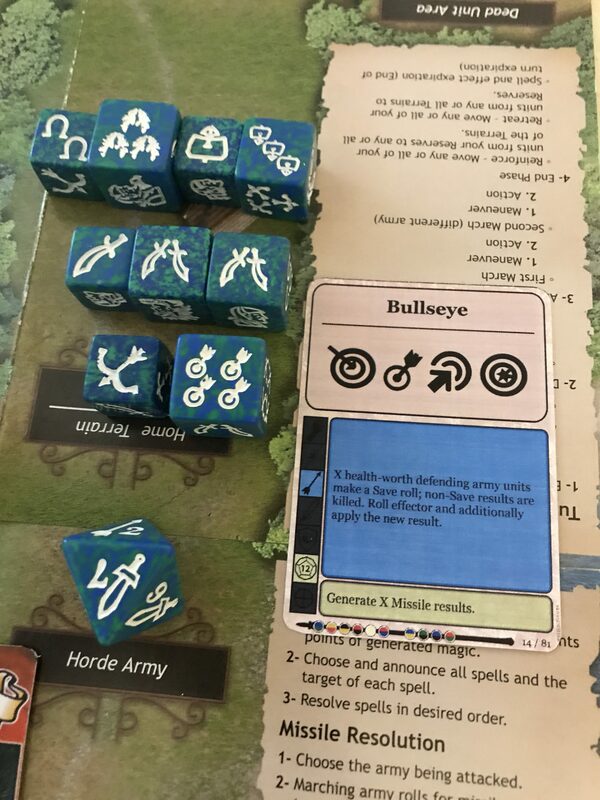 The elven archers take a shot at the dwarf infantry at their own terrain and produce 6 missile results (4 missile plus 2 from an ID). 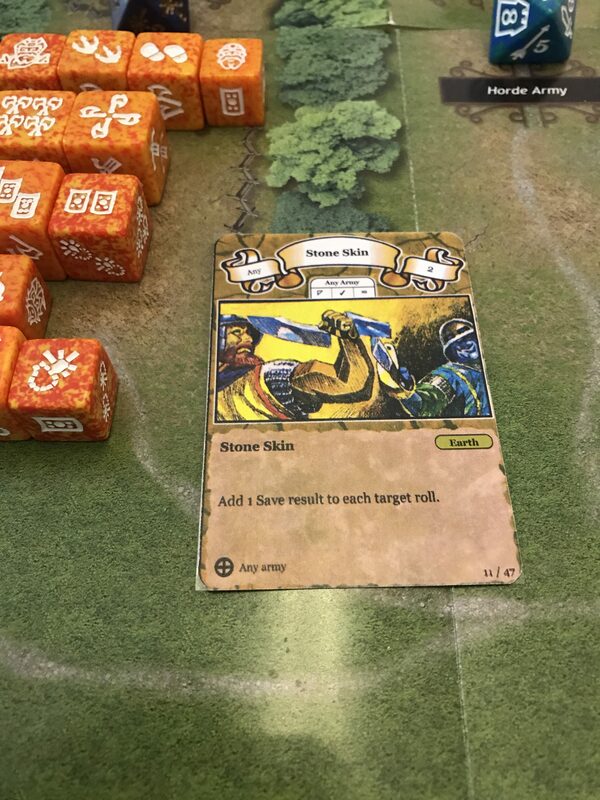 The dwarfs are surprised by the rapid attack and even the trample from the mammoth rider is useless at this distance. 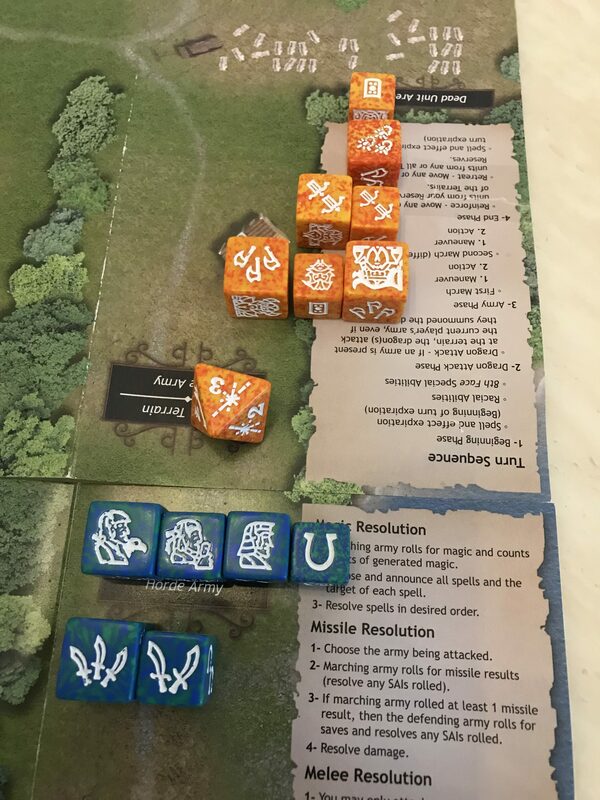 The dwarves, having generated no saves at all, suffer 6 points of damage……. 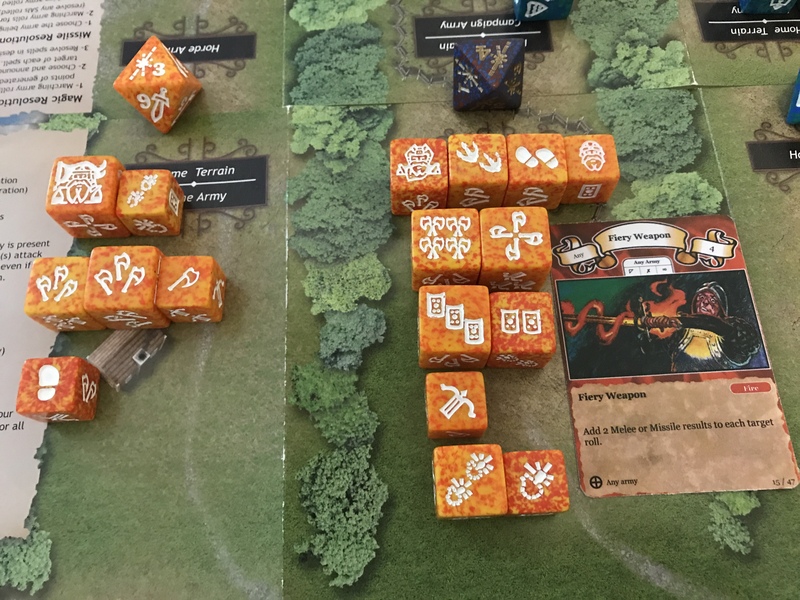 ….and two sentries, a sergeant and a lizard rider become the first casualties of the battle. 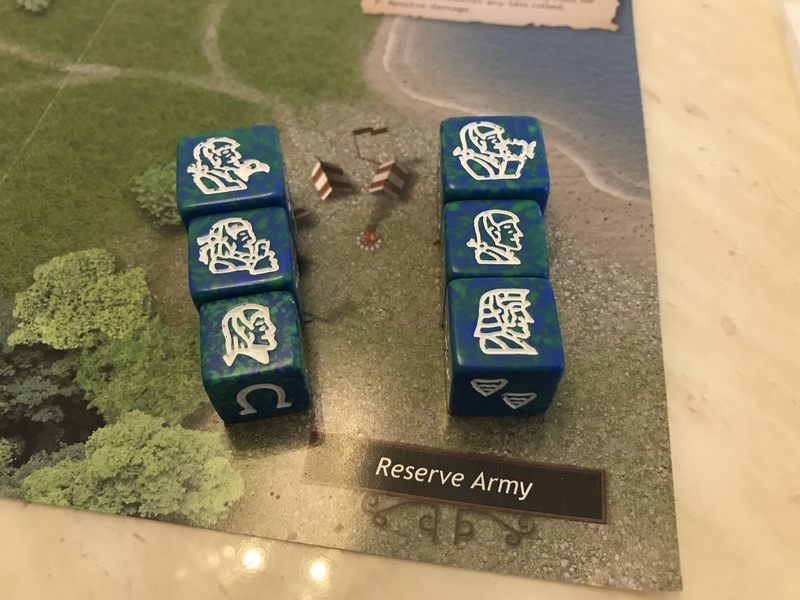 Having forced back a dwarf army and cast magic to help with the downfall another, the elves stationed in the highland head back to the coast an into reserves. 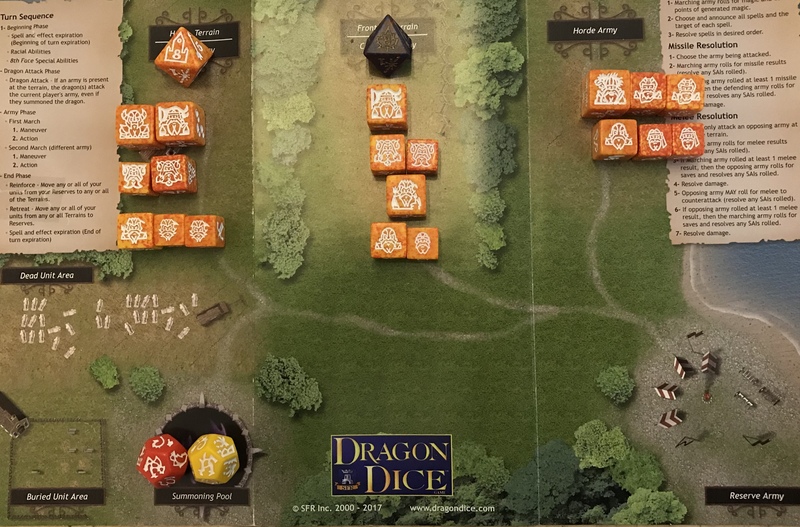 Although the dwarves are unaccompanied by any enemy at their home base, they are still a long way from the temple, and need to approach by moving the terrain up to its third face. The take advantage of the solitude and conjure up a little bit of magic. 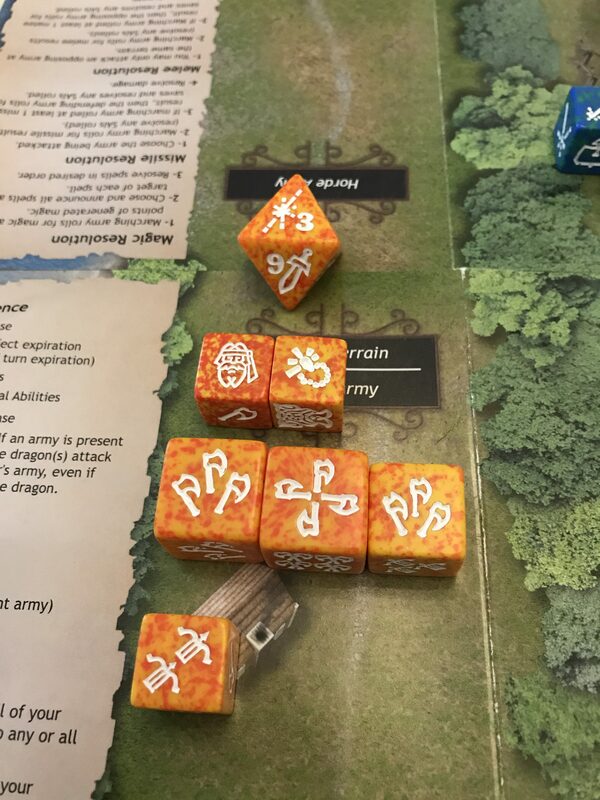 7 points of red and/or yellow magic generated by 4 magic icons and 3 ID points. 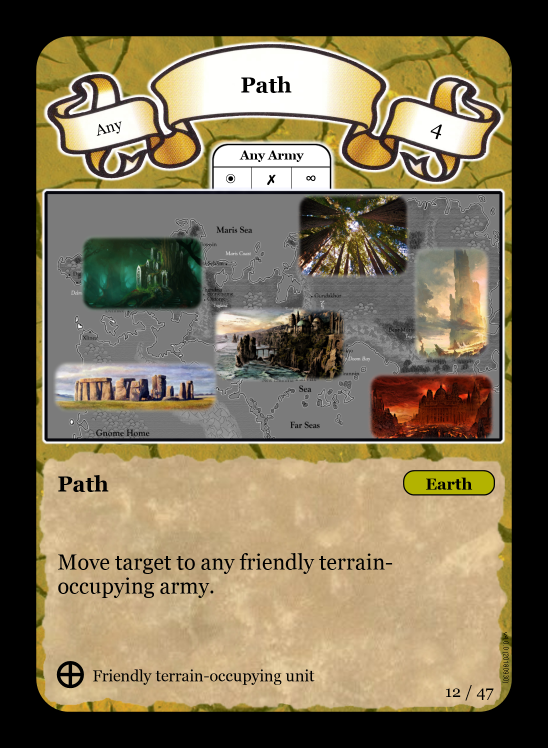 A Thaumaturgist is dispatched to the wasteland grove courtesy of an earth spell known as a Path. 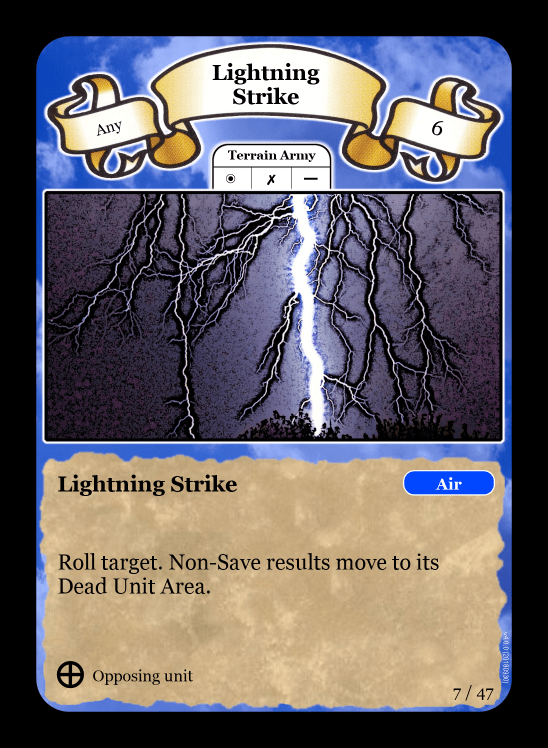 They also get an opportunity to reunite with an old friend, the Sentry, using a Resurrect Dead elemental spell. 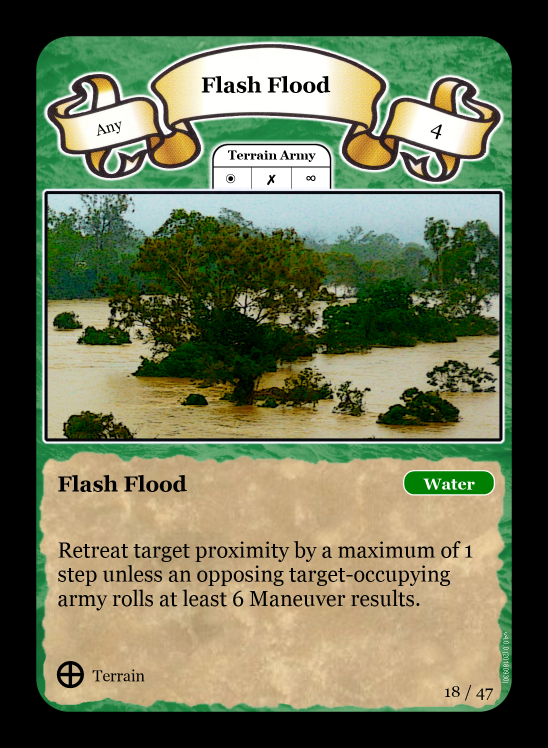 With three of their units now magicians, it is too early to start manoeuvre towards the vortex, and therefore no movement is attempted. 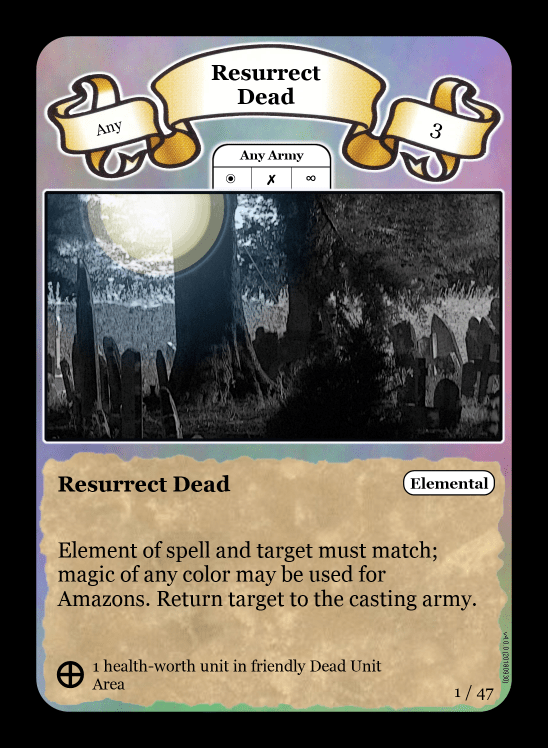 Time to conjure instead! 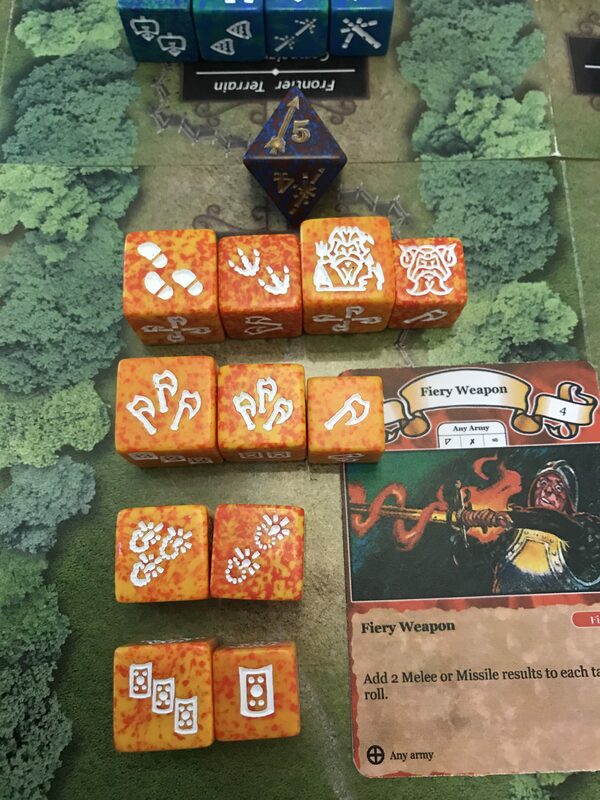 5 points of generated magic result in two fire spells this time. 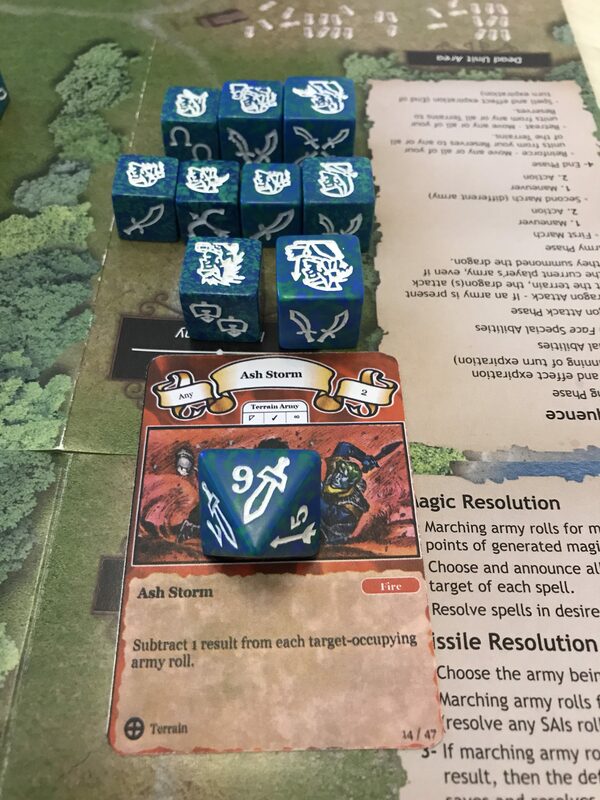 An Ash Storm will help block missile fire coming in from the elf archers at the coastland, currently on its 5th face and showing missile attack, and a dwarven Firebolt is thrown at an Evoker in the elf army at this terrain. 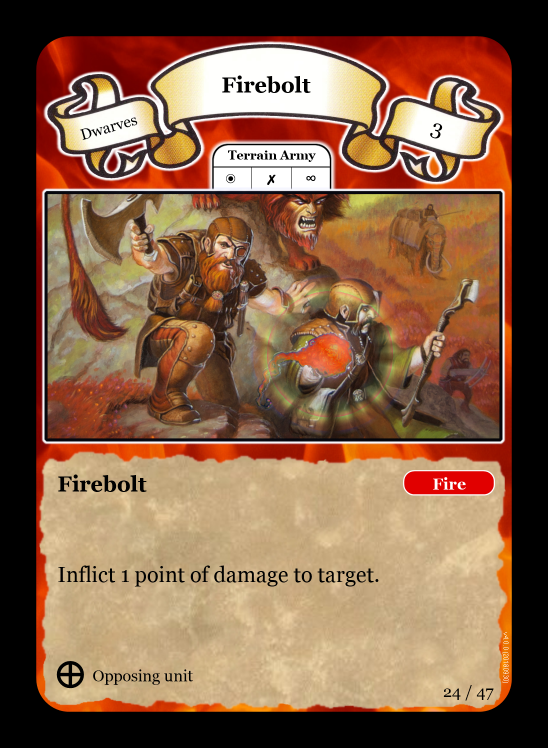 The Evoker sees the Firebolt coming and manages to quickly get out of the way. 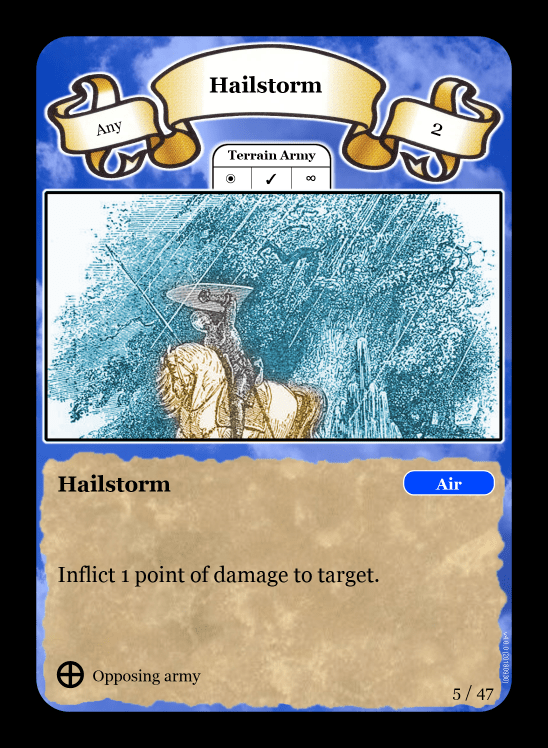 The spell harmlessly dissipates a few yards to his side. 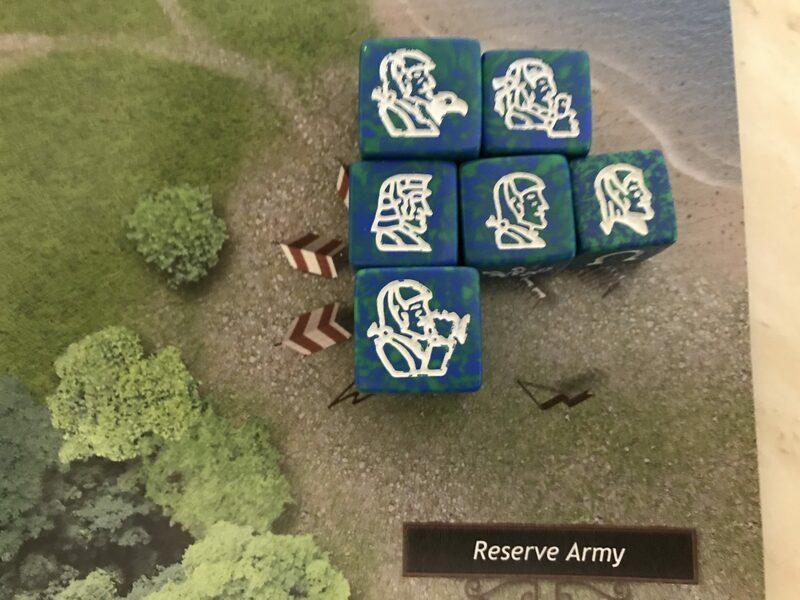 The depleted army from the coastland are joined by a Crossbowman from the highlands in the reserves, ready to be re-deployed. 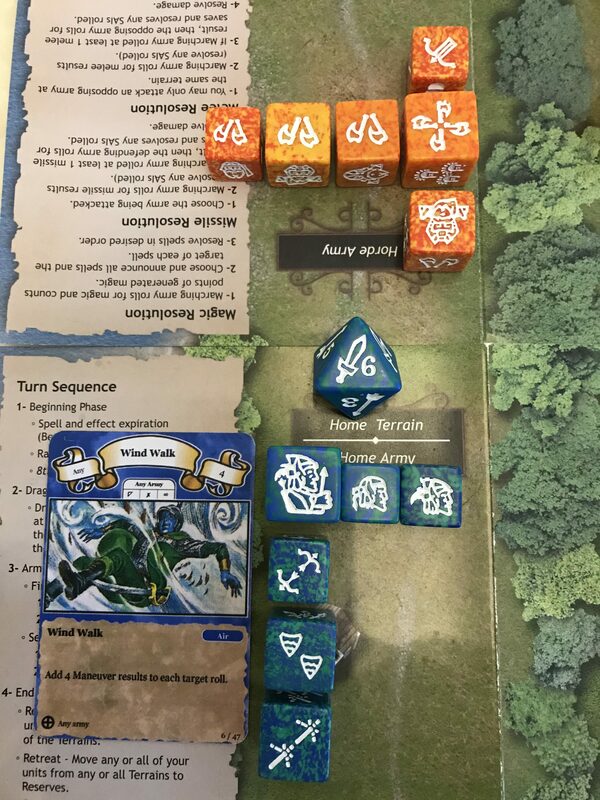 As the second round begins, so the Coral Elves’ Wind Walk spell expires, leaving only a Dwarven Ash Storm at the coastland terrain……. …. making now a good time to try for magical reinforcement from the Enchanter and his entourage over at the Grove in the wasteland. 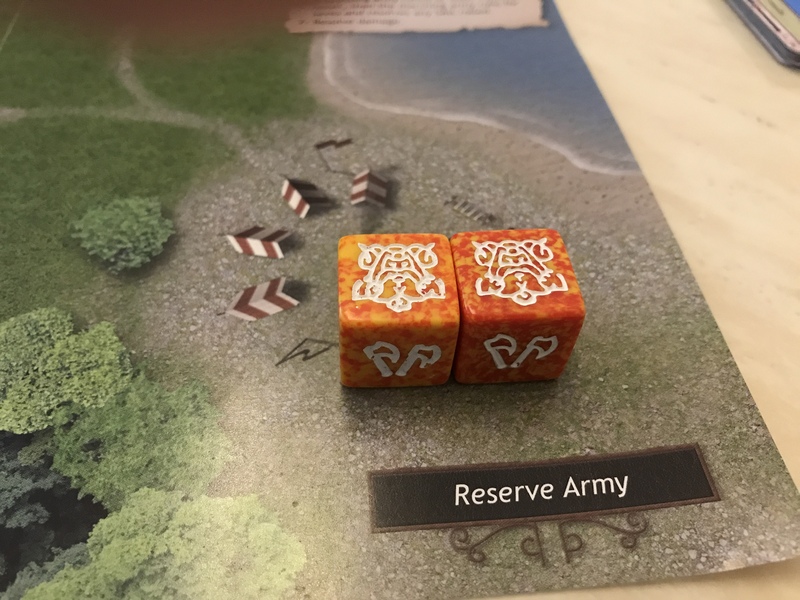 The 8 points of green magic that they generate is then used to try to pin back the approaching dwarven archers over in the highlands, knowing that the army there is not strong on magic casting units. 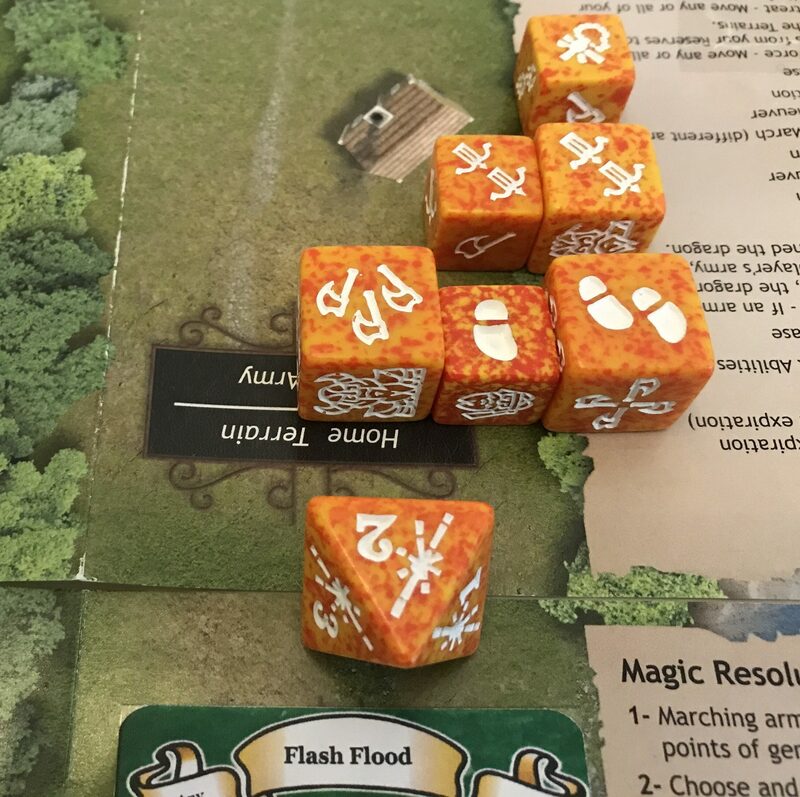 The stacked Flash Flood spells mean that the dwarf army needs to generate 12 or more manoeuvres or be forced back, with the terrain die going to its 2nd face. Even using its Mountain Mastery racial ability, this is going to be a tall order for them. 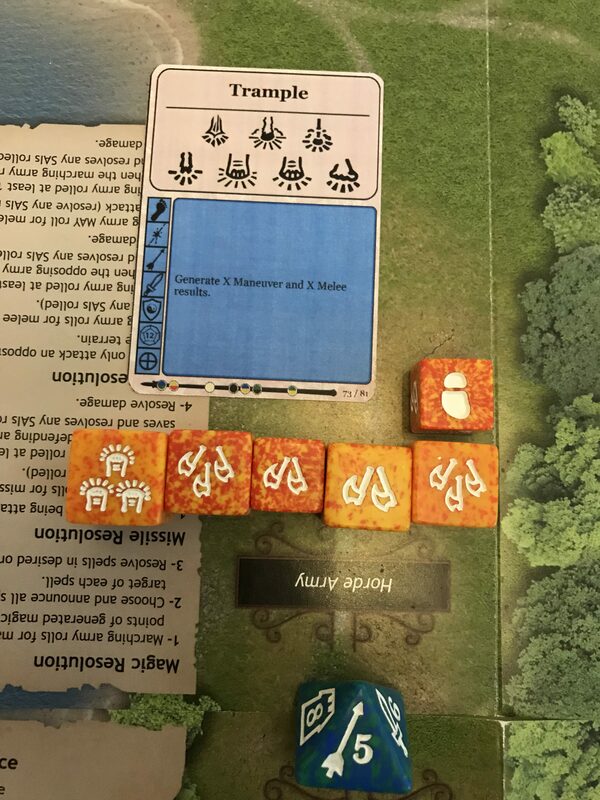 3 manoeuvres and 3 Mountain Mastery results are nowhere near enough to stop the dwarf army from being forced away from the temple and leaving them further away from a suitable distance for them to use their missile fire. The terrain turns down to its 2nd face. They feel a long way from home. 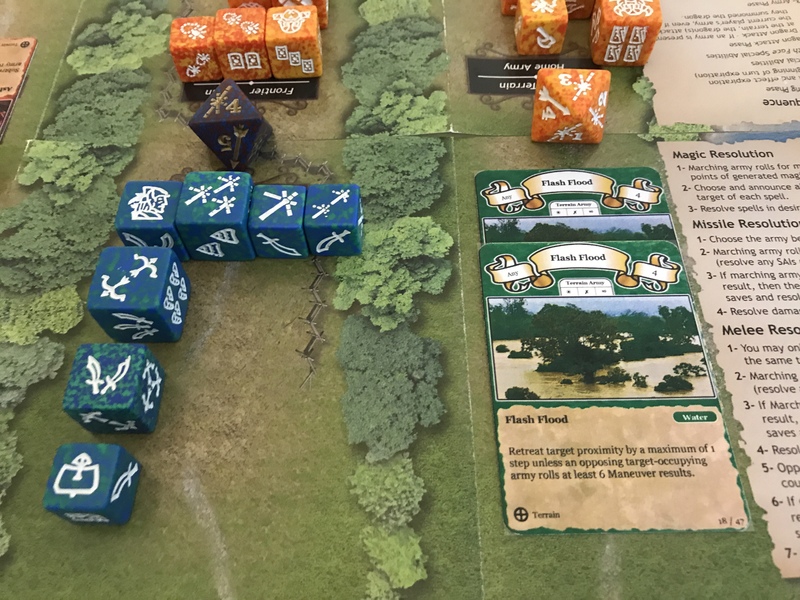 The coastland elves, on their own and not far from their tower, hear the cavalry reinforcements in the distance and move towards home, with the terrain die going to its sixth face. 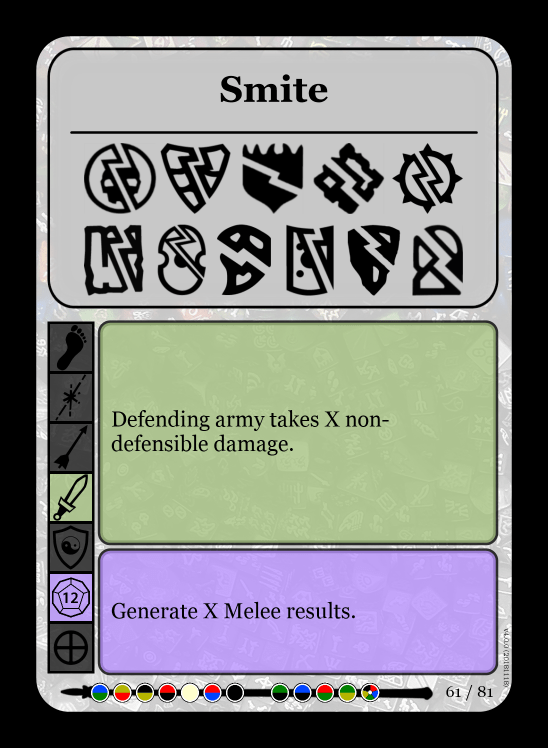 The elf reserves then split into two factions, with an Eagle Knight, Courier and Horseman deployed at the coast, and a Herald, Knight and a Trooper sent to support the magicians at the wasteland. 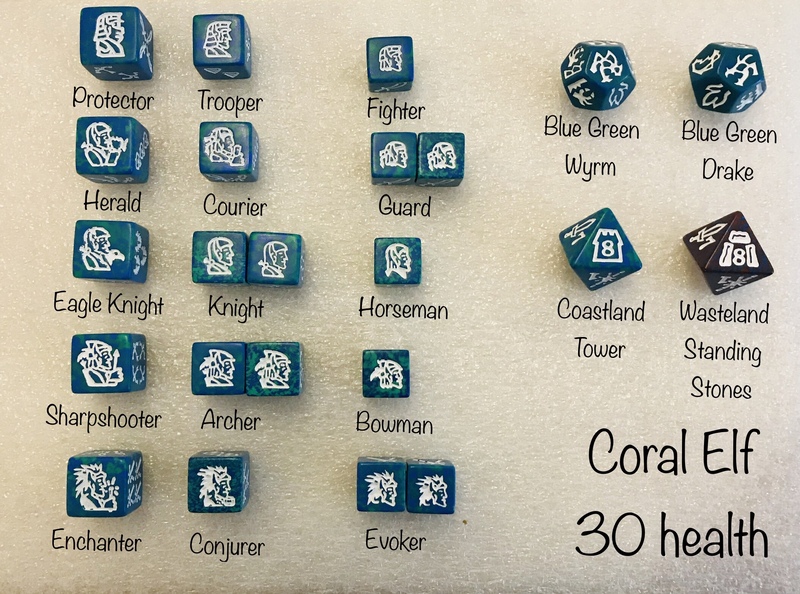 At the end of the Coral Elves’ 2nd turn, they are divided into two roughly equal armies, with a mixture of troop types in both. 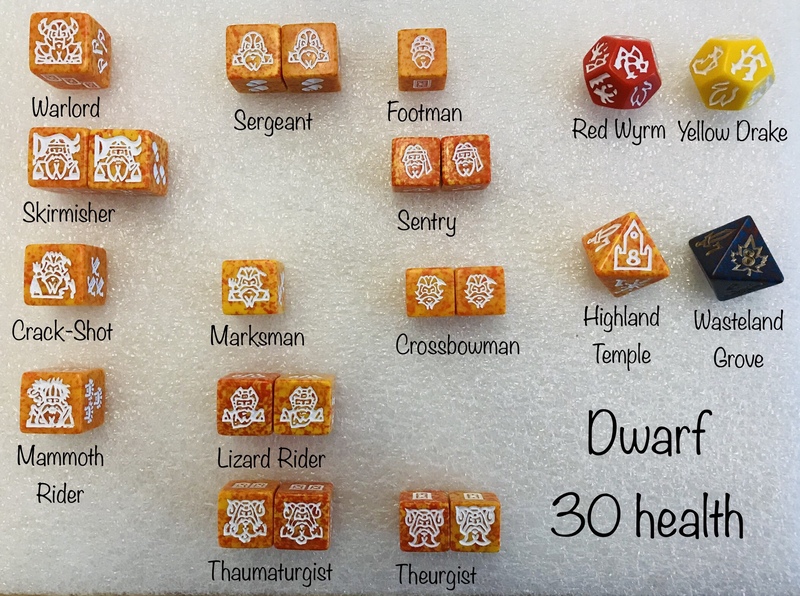 The dwarves have a lot of work to do. 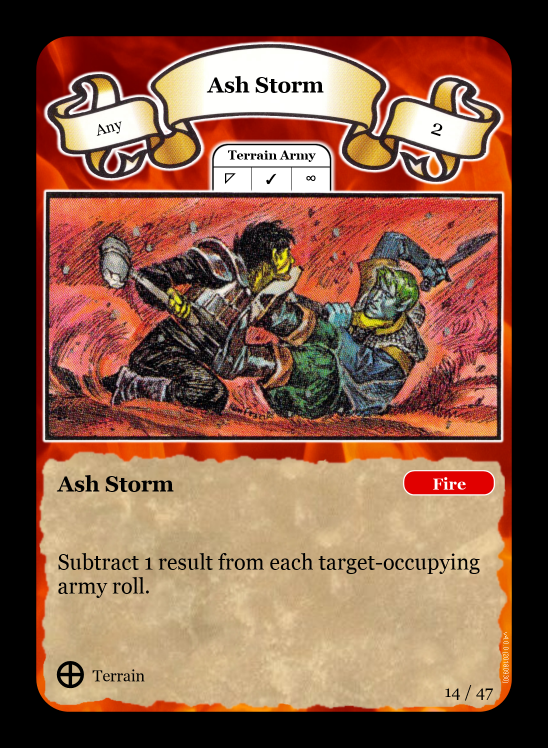 As the dwarves begin their second turn, the ash from the storm at the coast disipates. 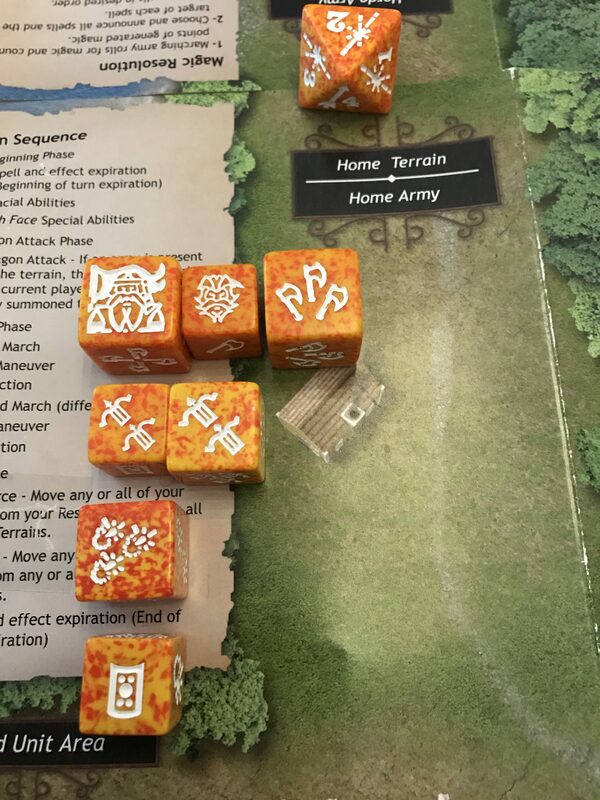 Now alone at their home terrain, the dwarf army make their way towards the temple once more. 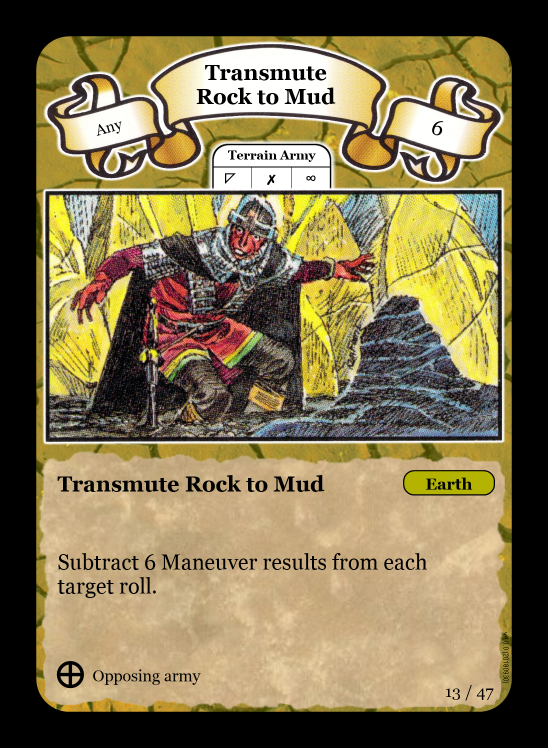 The terrain die moves on to the third face, and they make use of the fact that they are still in magic casting distance by producing a couple of red or yellow magic results, along with illustrating their melee prowess needlessly to the mountains. 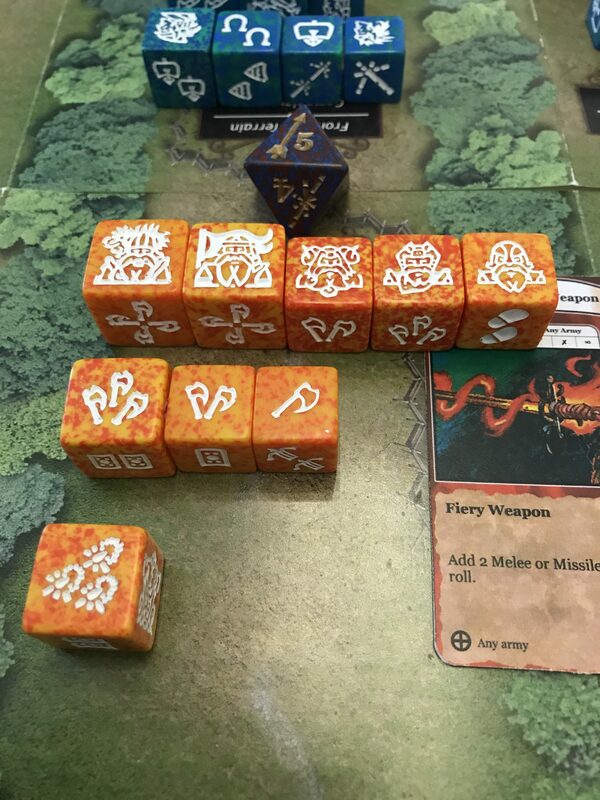 Being aware that the coastland elves are heavily armed with missiles and are only one notch away from being able to fire at the wasteland, they use these points of yellow magic on a Stone Skin spell, giving a small amount of magical protection should the elves decide that they like dwarfish pin cushions. 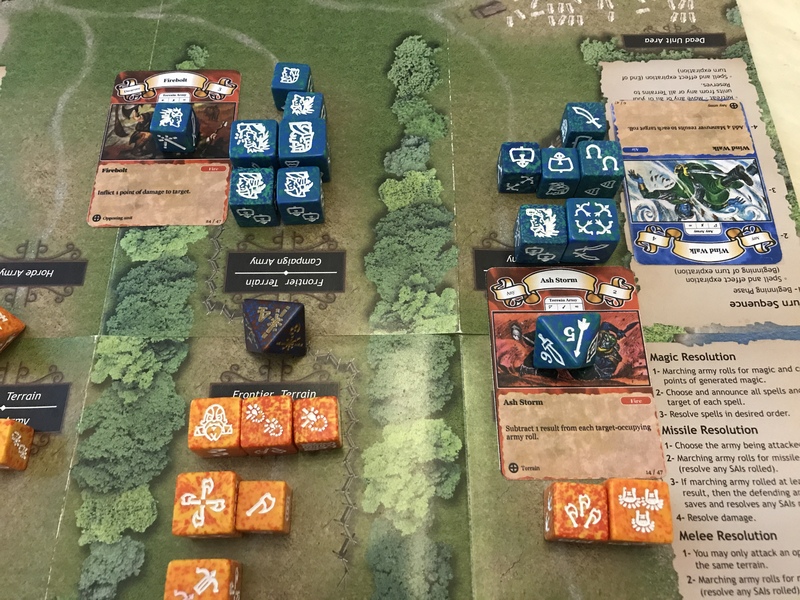 Hearing the reinforcements on their way from the reserves, the dwarves at the frontier attempt to close in on their opponents, but fail by only achieving 4 results against 7. 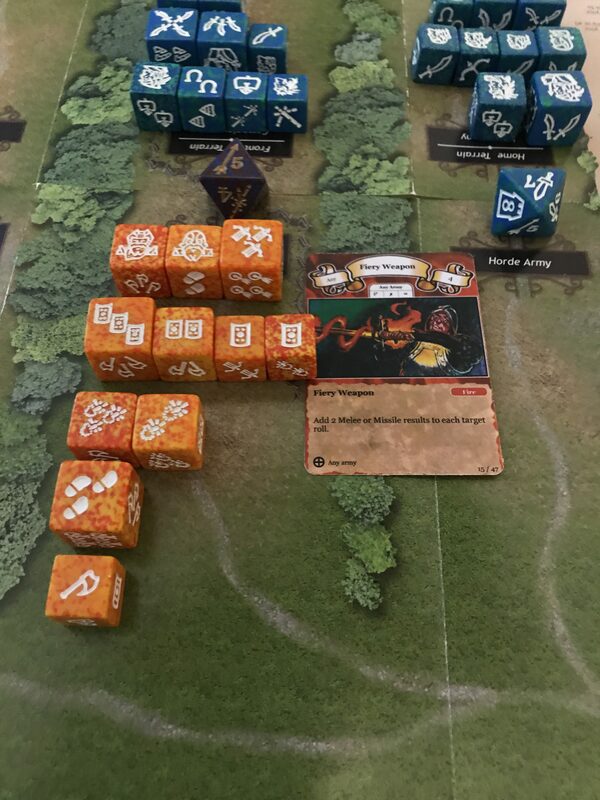 The terrain die remains on its 4th face. 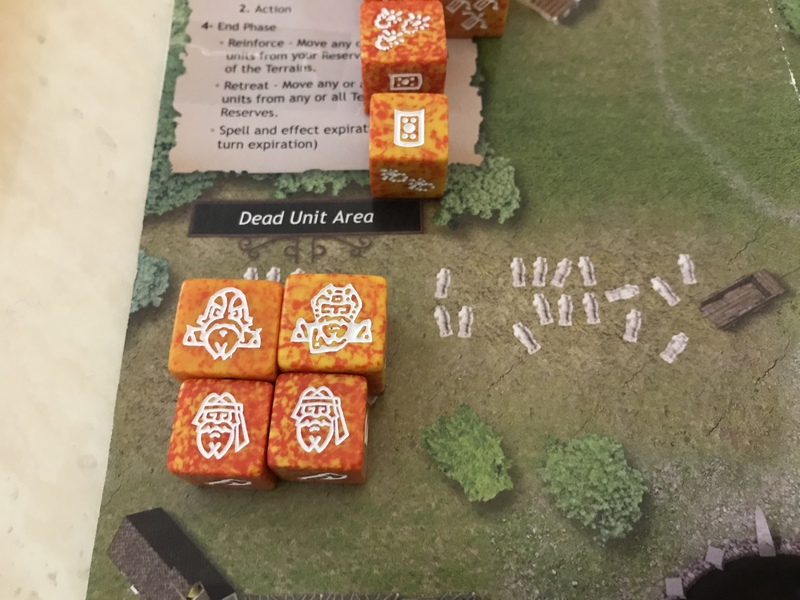 …..to bring back a 2 health Lizard Rider from the grave, and secondly …..
……..calling up a Mammoth Rider, another Lizard Rider and a crossbowman from the reserves. 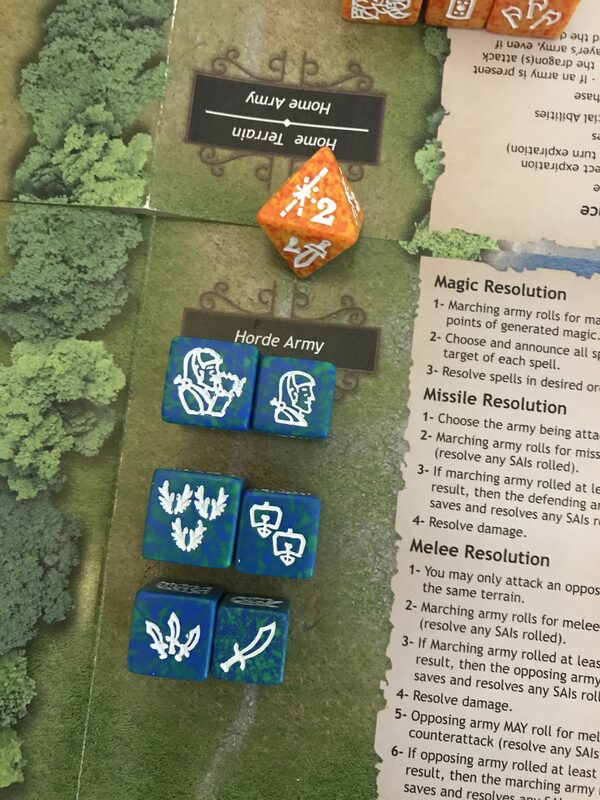 Having remained camped out since the start of the battle, both sides, elves especially, suddenly show a surprising amount of inertia when they try to move closer. 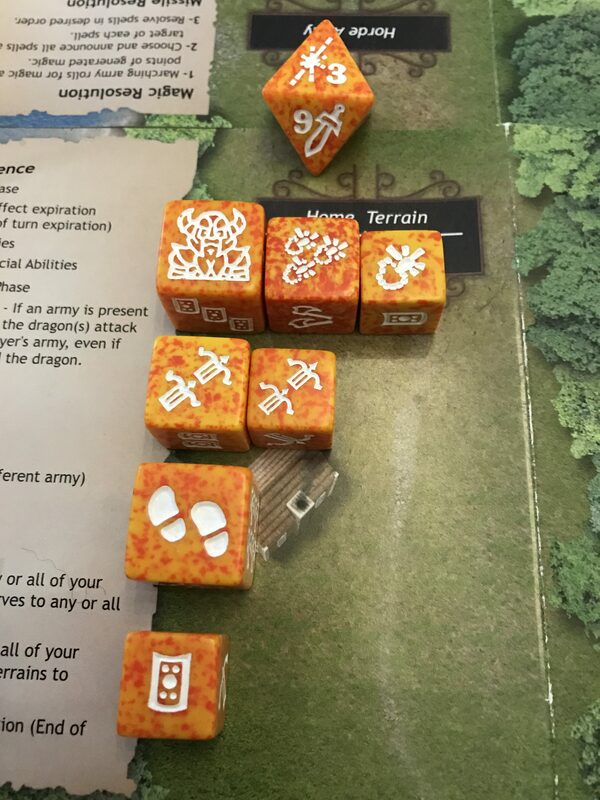 The terrain die does not move. 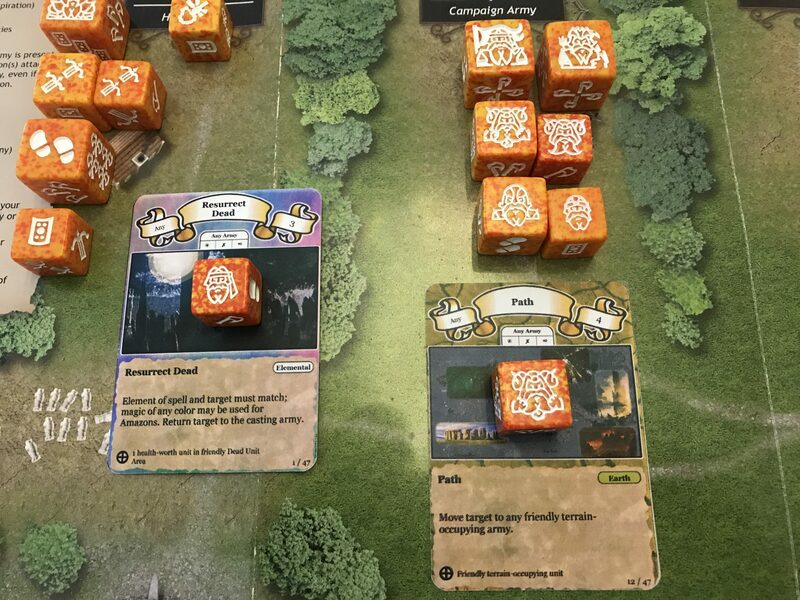 This is then followed by an equally uninspiring attempt from the elven mages to produce some useful magic. 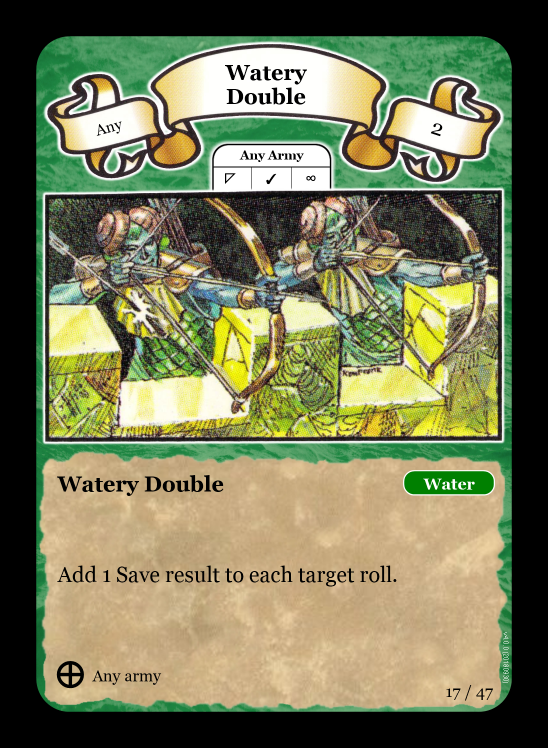 The counter that is produced during the attempt serves as a reminder as to the overall futility of this attempt producing, as it does in magic attacks, absolutely nothing here. 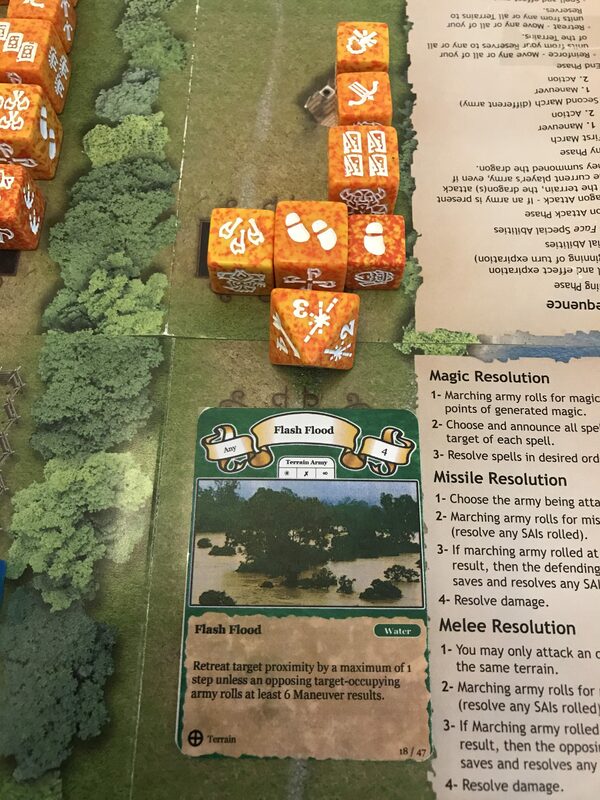 The four magic results are used on a somewhat hopeful Flash Flood (now being seen as a Coral Elf favourite tactic by the Dwarves) and are just resisted, once again thanks to the Mountain Mastery ability of the Dwarves, as the required 6 manoeuvre results are exactly achieved. Over on the coast the marching Coral Elves meet no resistance as they close in on their home tower. The terrain now reaches its 7th face. 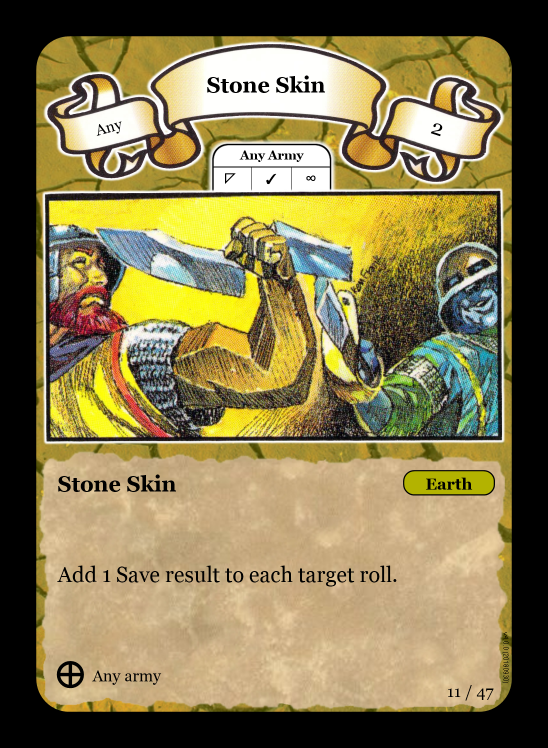 As the Dwarves turn begins, so end the effects of the Stone Skin spell that they previously cast to protect their frontier army in the wasteland. 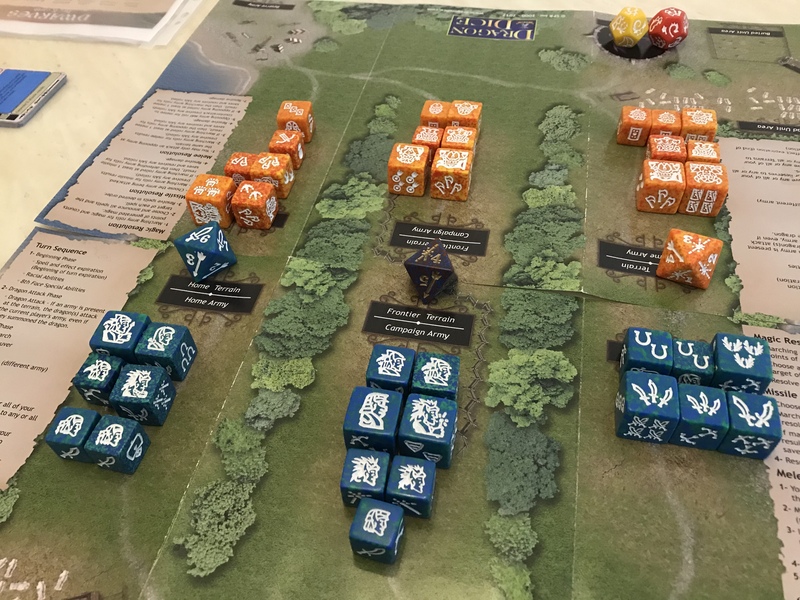 The highland Dwarf army hatch a plan to try to bring down the Coral Elves on the coast. 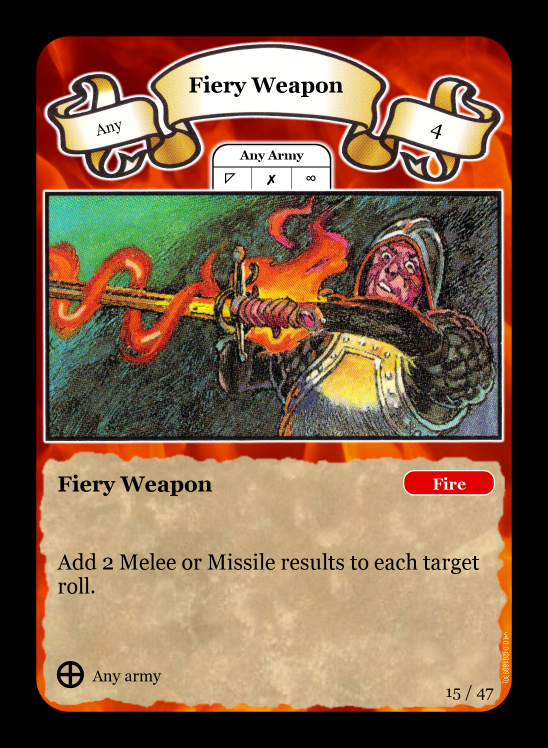 They manage to generate a fire spell (red) known as Fiery Weapon, in phase 1 of an attempt to attack them with missile fire. The next part of the plan depends upon the agility of their neighbours. 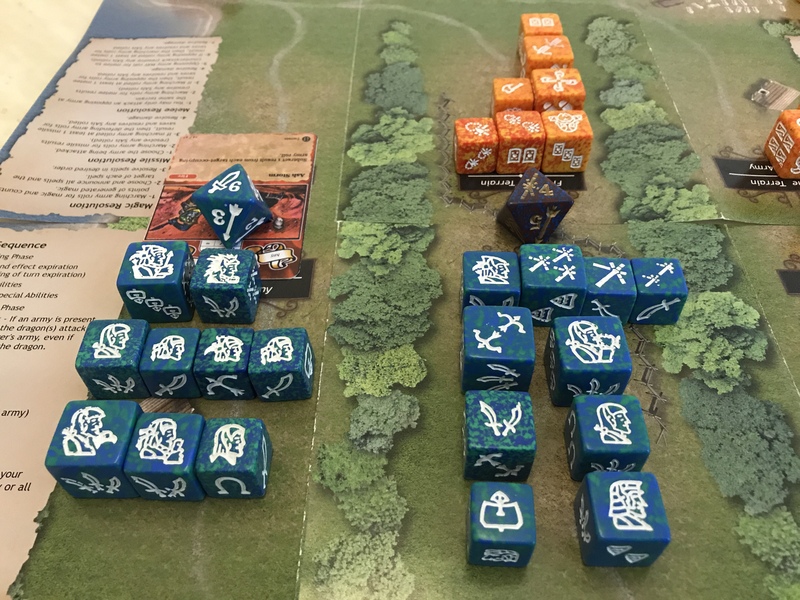 Part 2 of the plan is also successful, as the Dwarves march forward by winning the manoeuvre battle by a margin of 9 to 6. 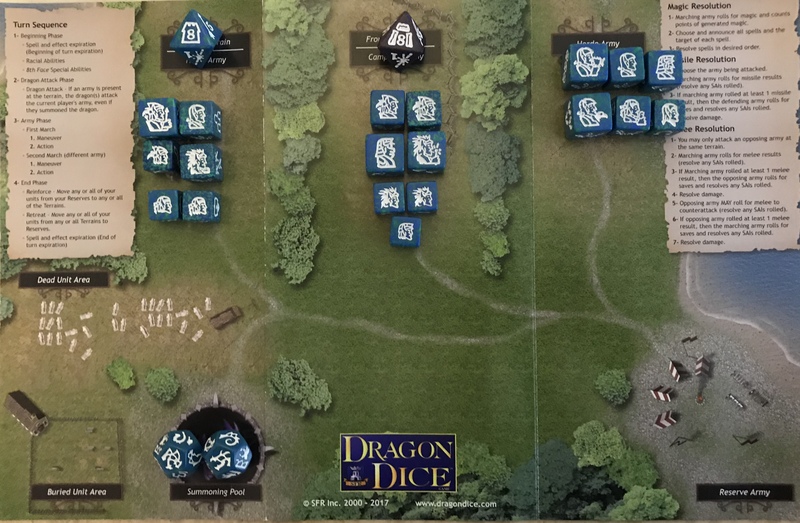 The terrain die moves up…. 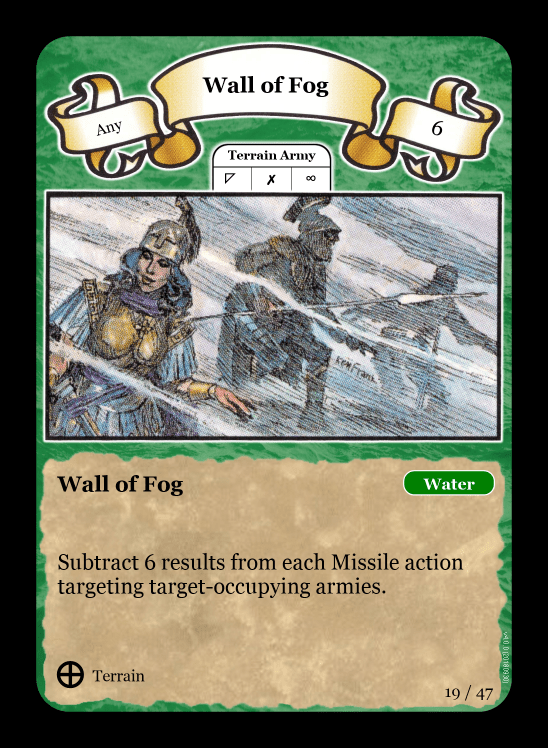 … to its 5th face, showing that the Elves are within missile range. Oh, how lucky! 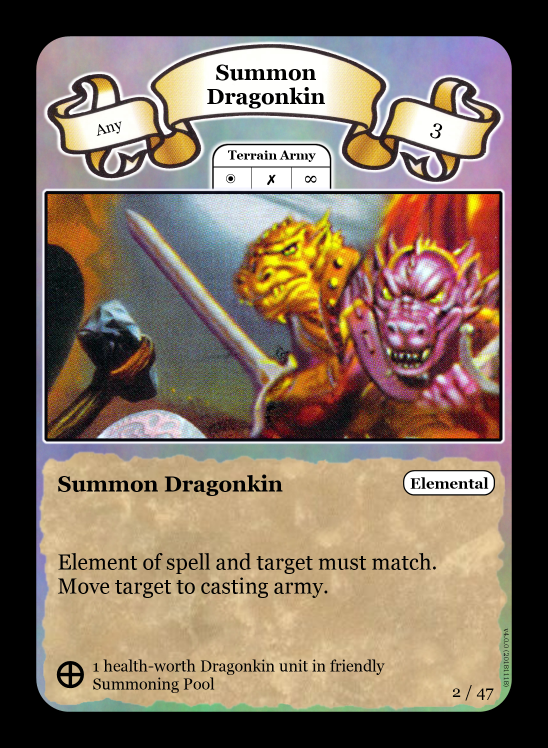 They even have a fiery weapon spell on them to help their cause! 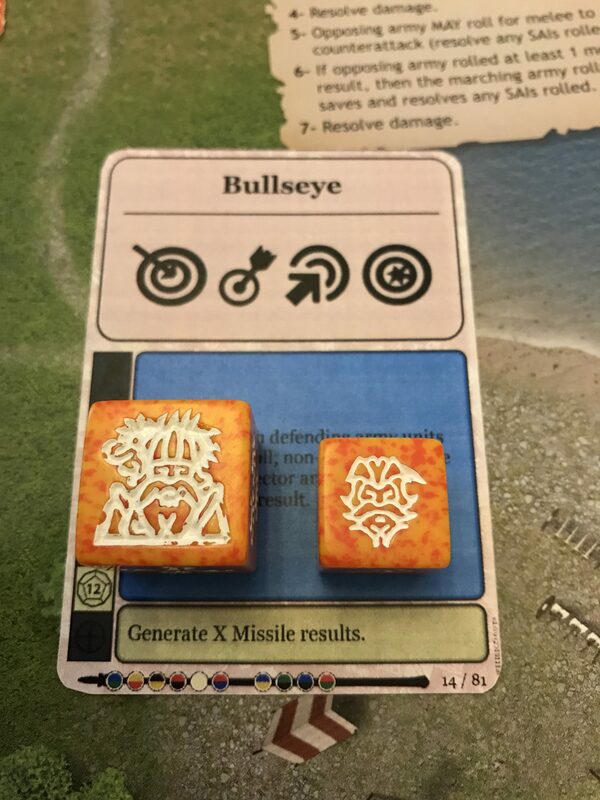 A total of 9 missile results are generated, 4 from IDs, 3 normal missile icons and 2 more from the spell. 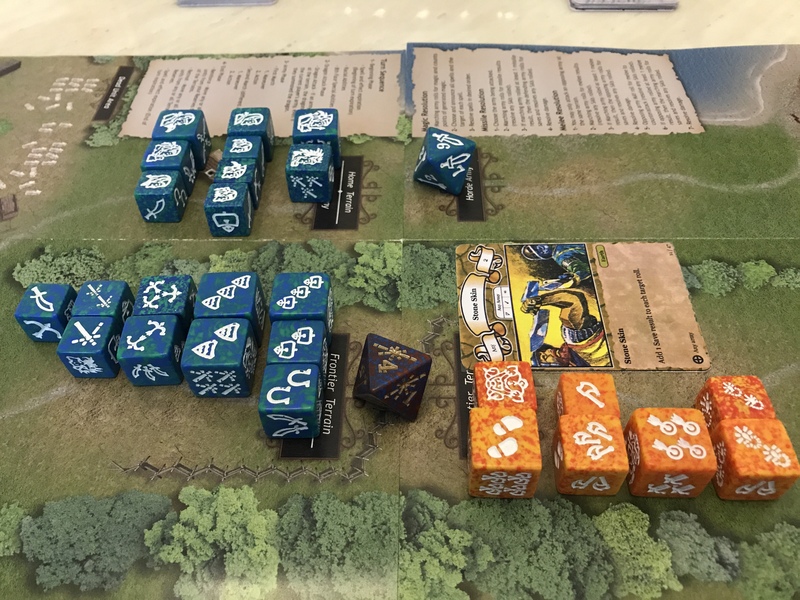 The Elves generate a mere 5 saves but, thanks to their Coastal Dodge ability in coastland terrain, their manoeuvres generate a further 8 saves, bringing them to a total of 13. 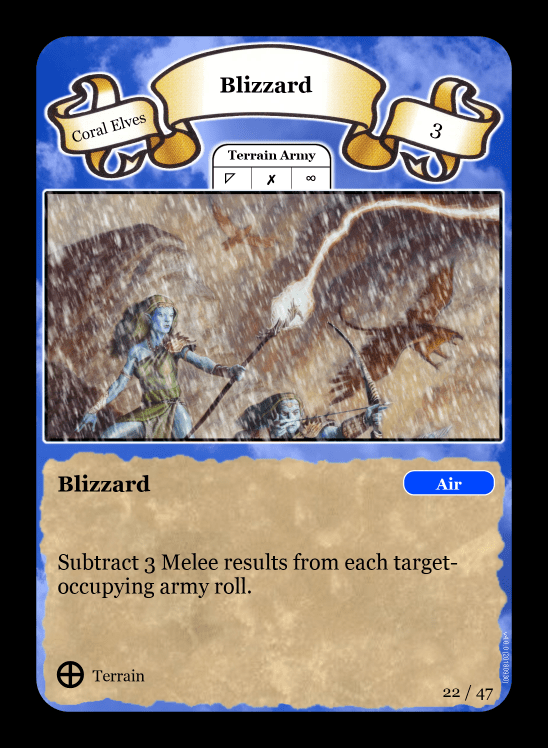 More than enough to fend off the 9 missile hits from the Dwarves, who now receive further bad news in the form of the Coral Elves’ other ability in terrains based on the water (blue) element – they counter attack with missiles!! 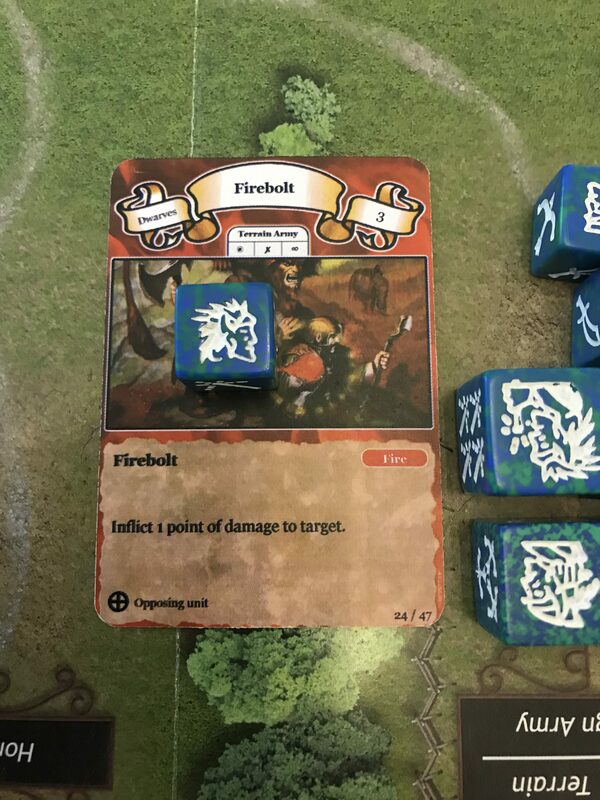 The Defensive Volley racial ability is unique amongst the races in that it allows Coral Elves to return missile fire and it does not matter what face is showing on the terrain where they stand. 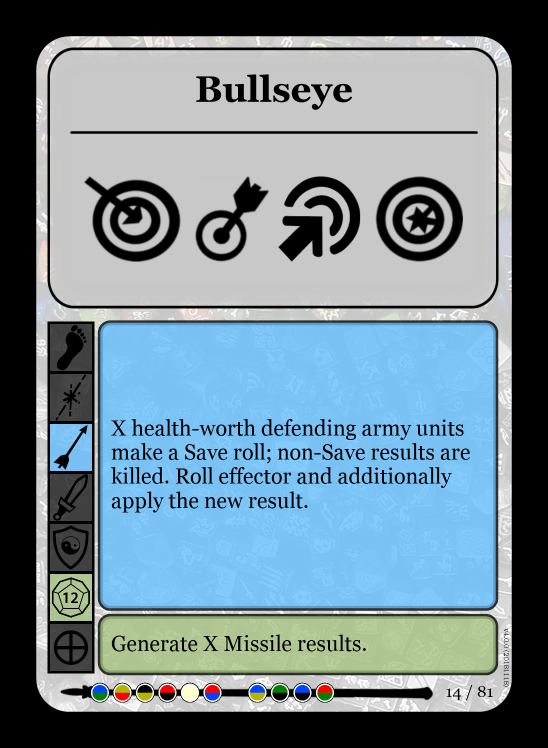 Despite only producing 5 missile results, 4 of them are bullseye results, meaning that they can be directed at individuals, which have to make saves. 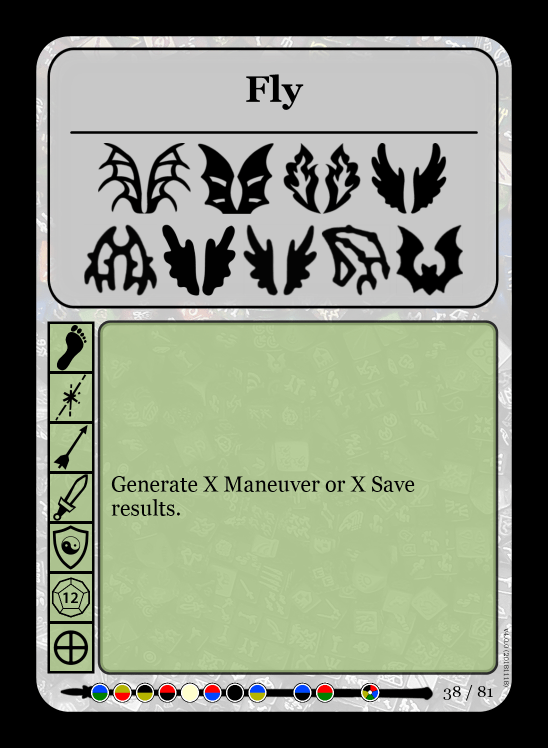 Any saving spells that are on the army are ignored, as they affect the army as a whole entity and not the individual units within the army! 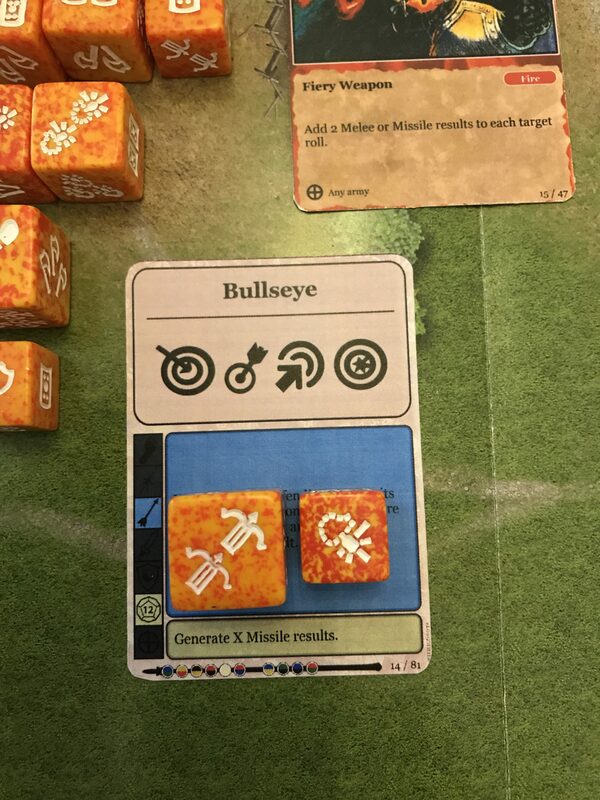 A Crack-shot and a Theurgist are targeted, and both fail to make a save. 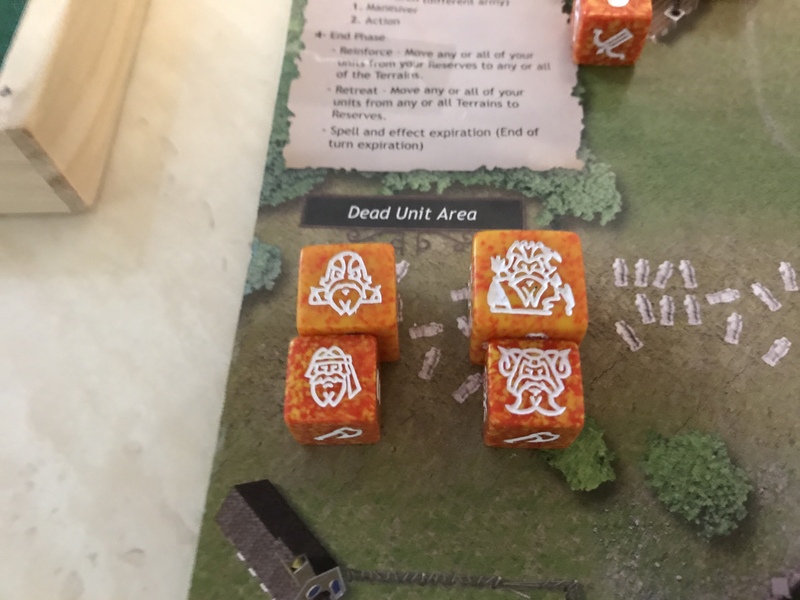 The Dwarf army is two more units down. 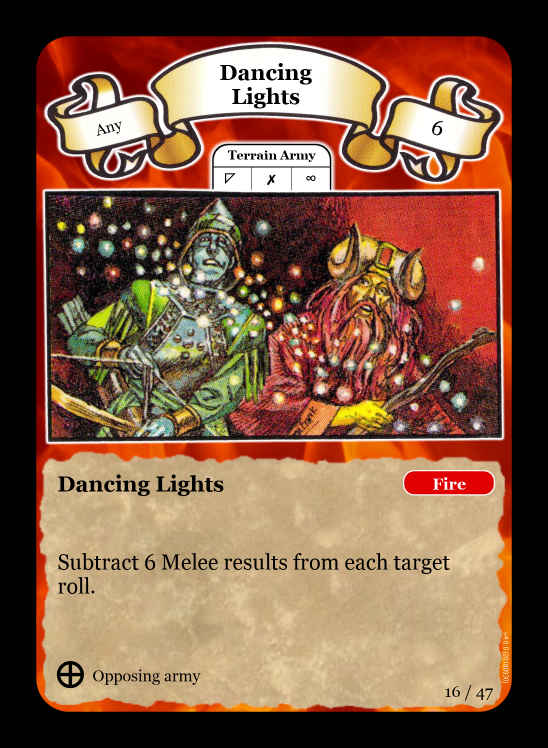 Furthermore, the Elf Sharpshooter is firing again, but they have only generated 1 missile hit so far. What’s the worst that can happen? That was supposed to be a rhetorical question. The Sharpshooter comes back for an encore. 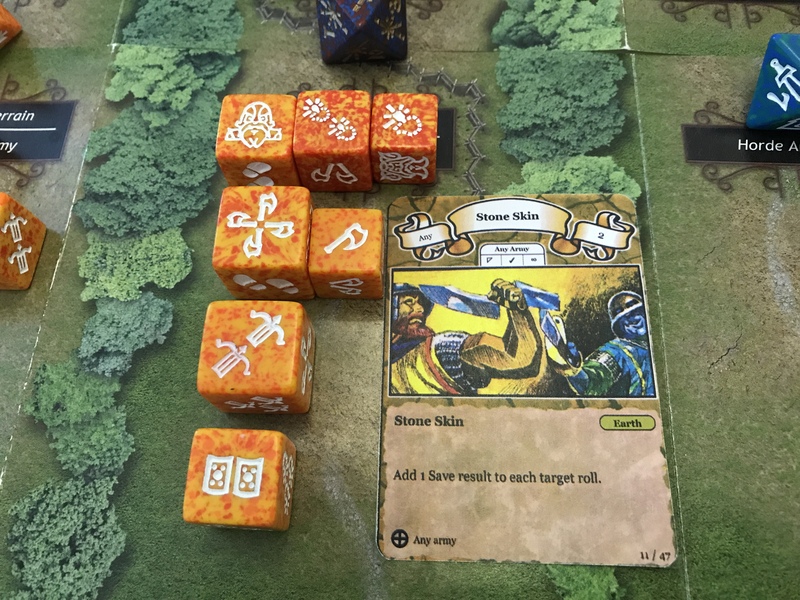 Luck changes for the Dwarves as both targeted Mammoth Rider and Crossbowman manage to evade being hit. The Sharpshooter is ready to fire again!!! 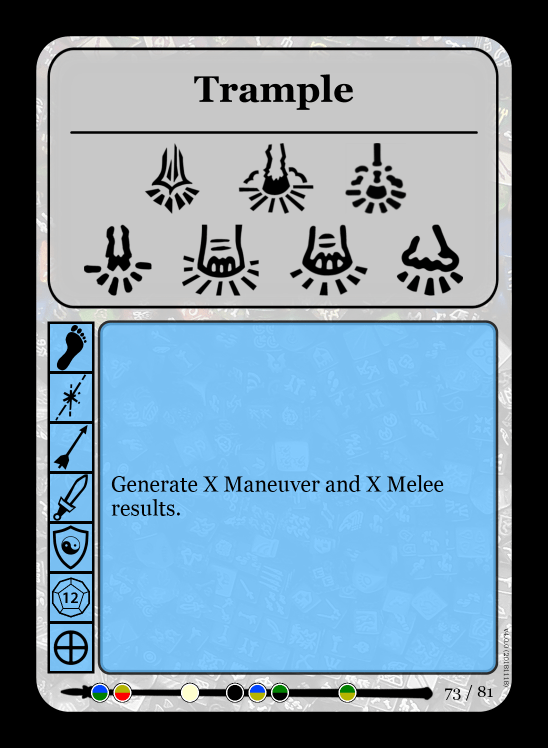 This time 4 ordinary missile hits are generated, leaving the Dwarves to defend against a total of 5. 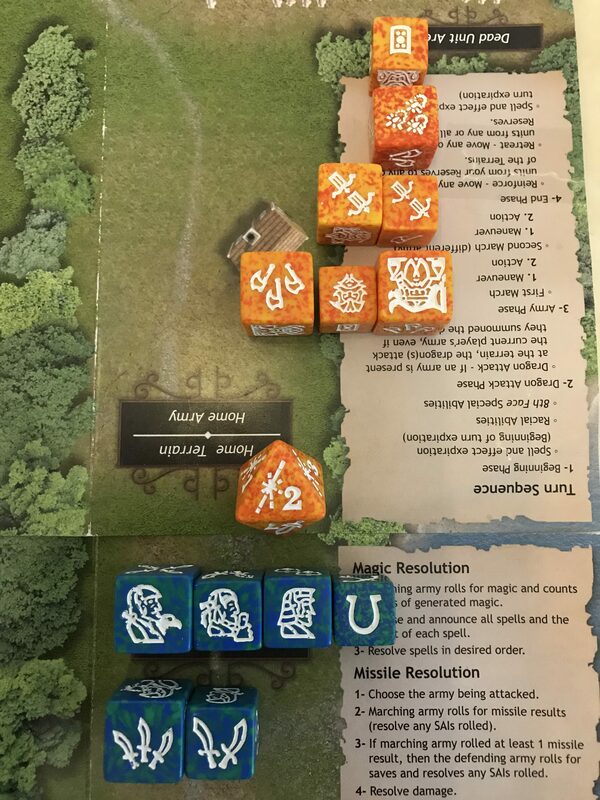 The dwarves get the feeling that their luck is starting to change, as 12 saves, all from ID results, counter the elven missile attack with ease. 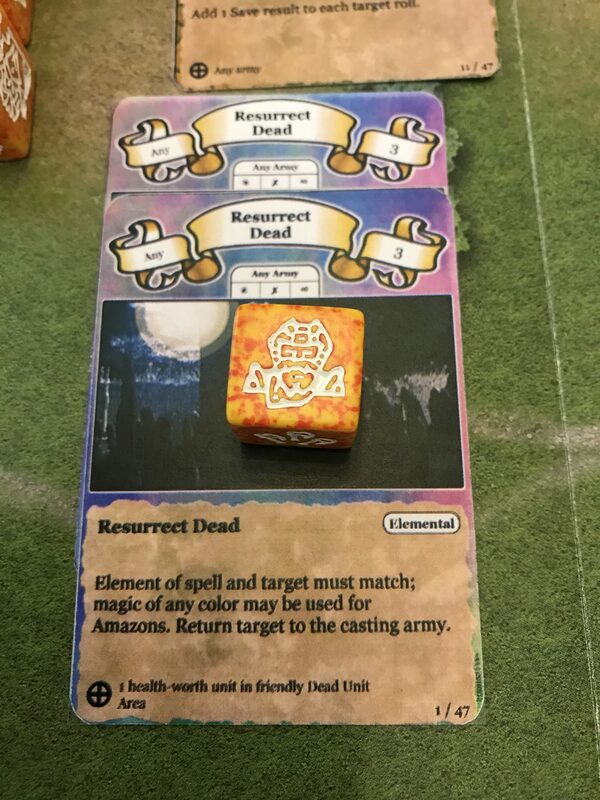 As no magic is required at the frontier, the Thaumaturgists move to reserves, hoping to resurrect a few old friends. Link to part 2 of the battle.